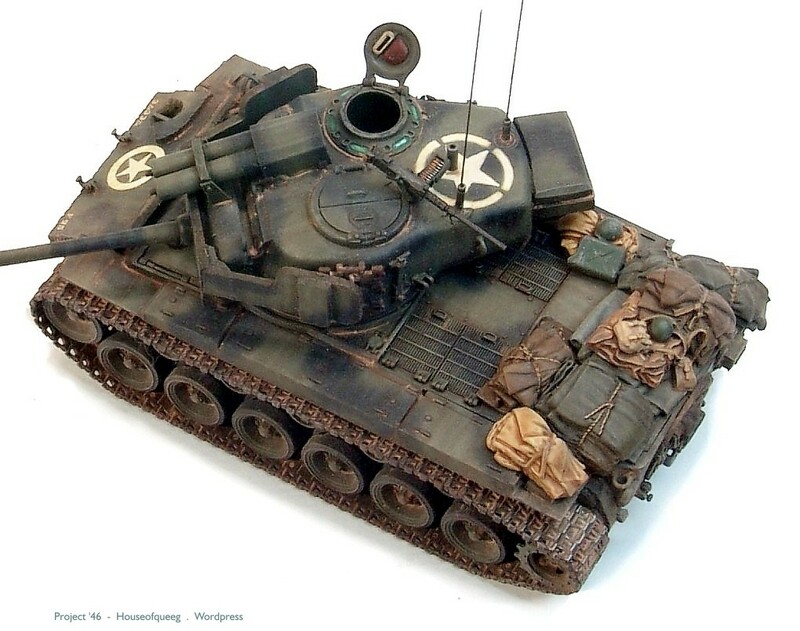 And a bit of spiel, Tamiya base kit, Blackdog stowage, scratch built gun and armour package. 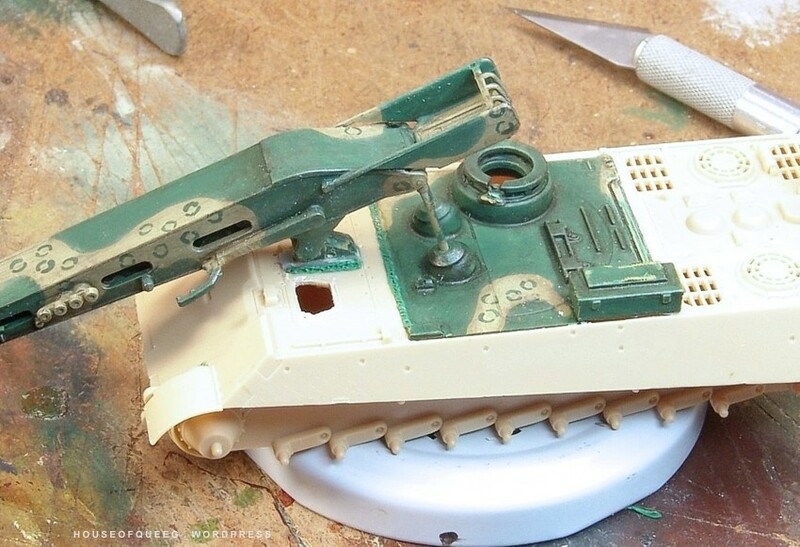 The stowage was nestled down onto the back deck (a pet hate is “floating” resin stowage) using the Dremel and a layer of greeenstuff. 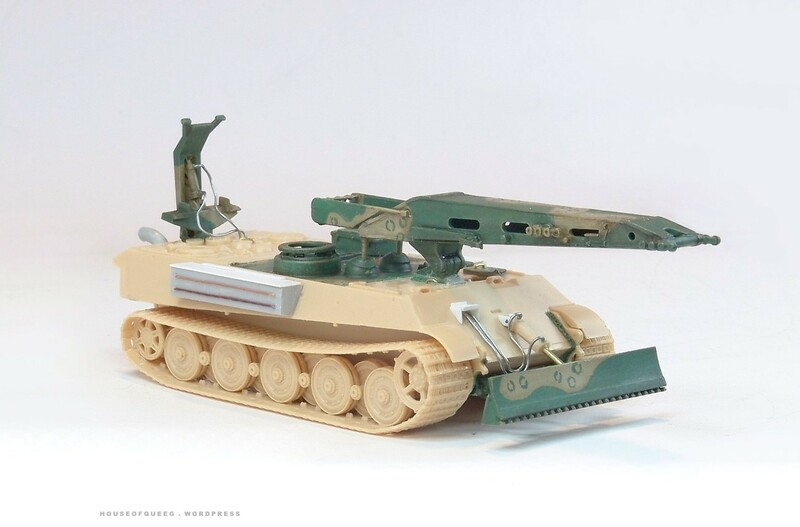 The amour plate was guesstimated using ref pics of both the real thing and other models and the gun was made using a piece of sprue, trimmed to length and with a tapered breech end piece and the original Tamiya muzzle brake at the business end. 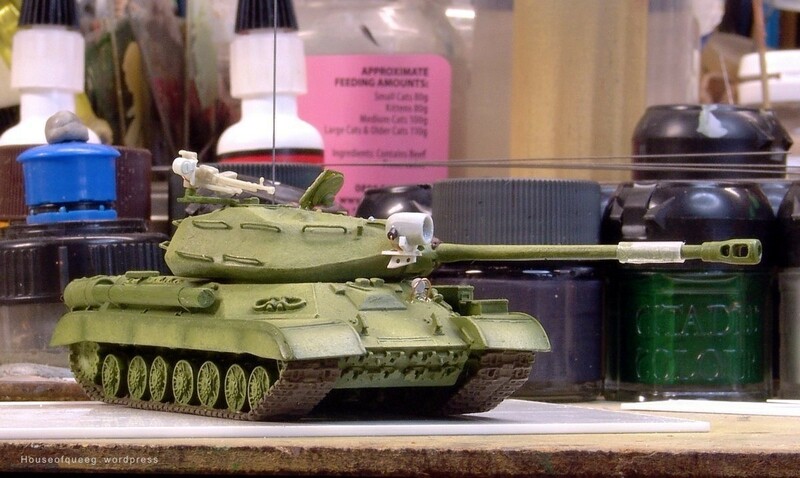 Finished as usual mostly with GW acrylics over an enamel primer base. 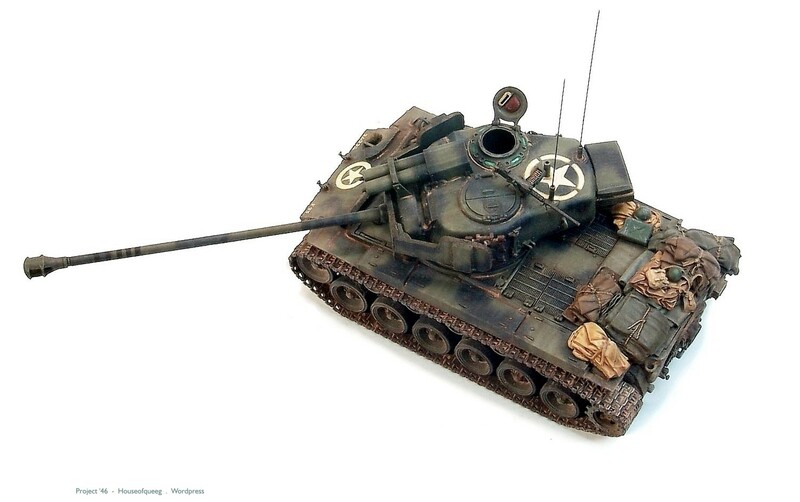 The big star on the turret is handpainted and the rest of the markings (ficticous) are from the Tamiya kit. 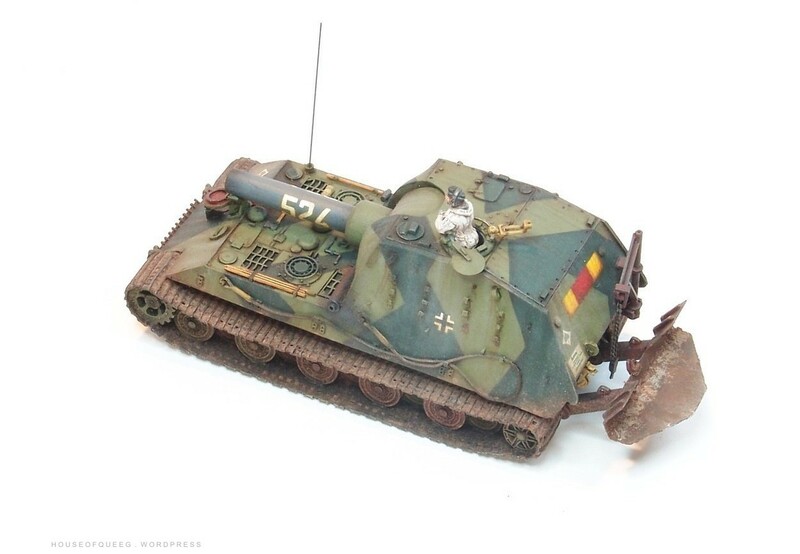 It’s now on it’s way to it’s new home and should make an appearance in a tournament game of Bolt Action over Easter weekend. 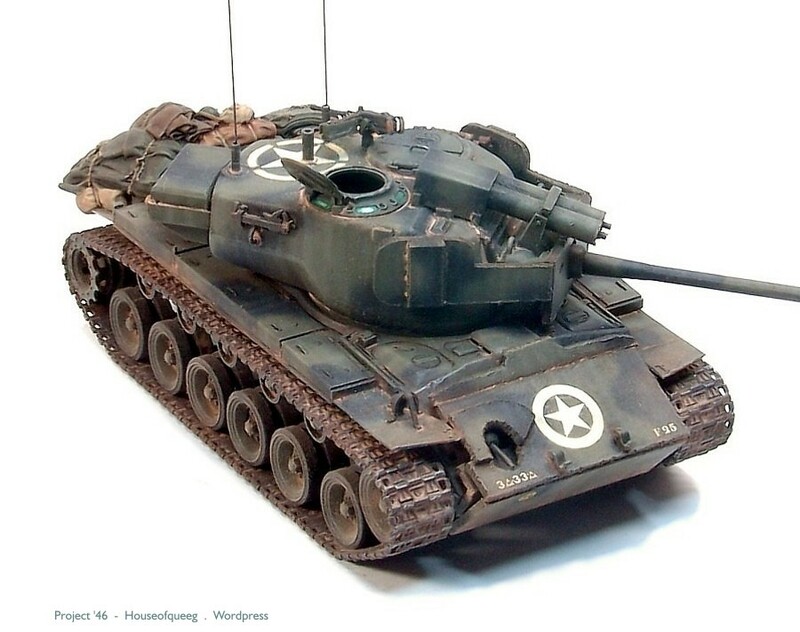 Tamiya 1/48th Pershing, Hobby Boss 1/35 Super Pershing …. 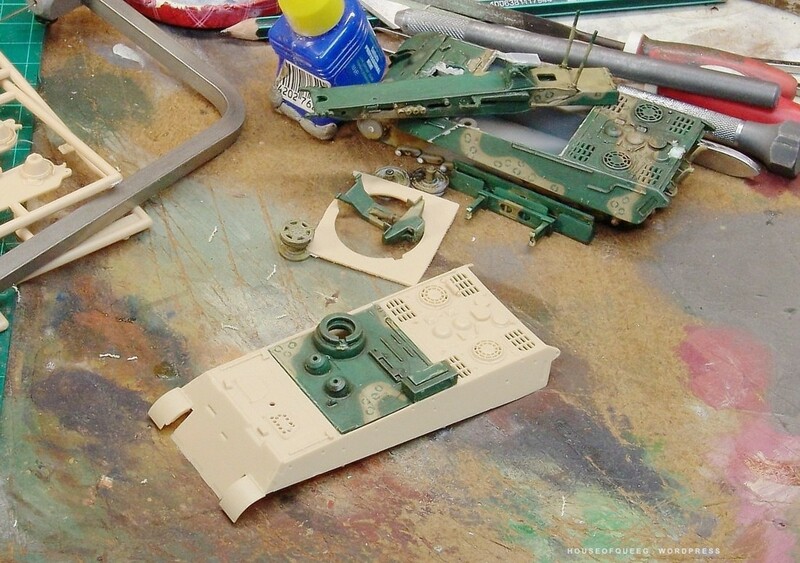 Work begins on the 1/48th Super Pershing conversion beginning with the lower hull. 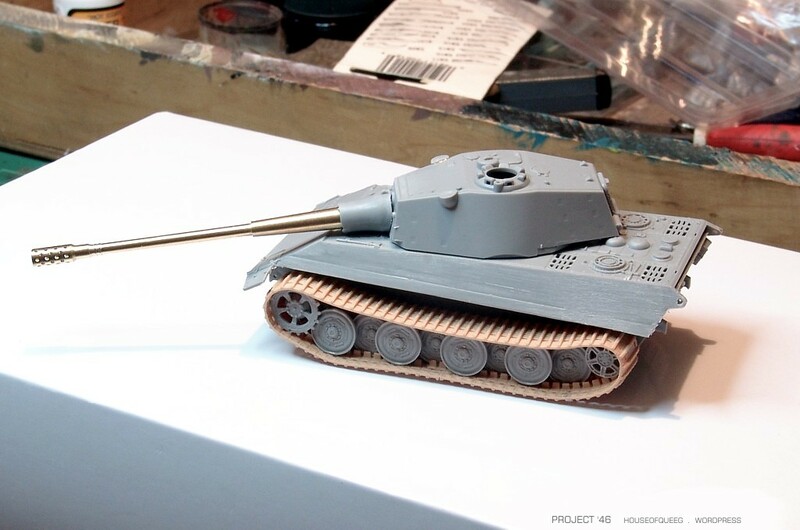 Like all 1/48th Tamiya kits (those that I’ve built anyway) assembly is very straight forward. 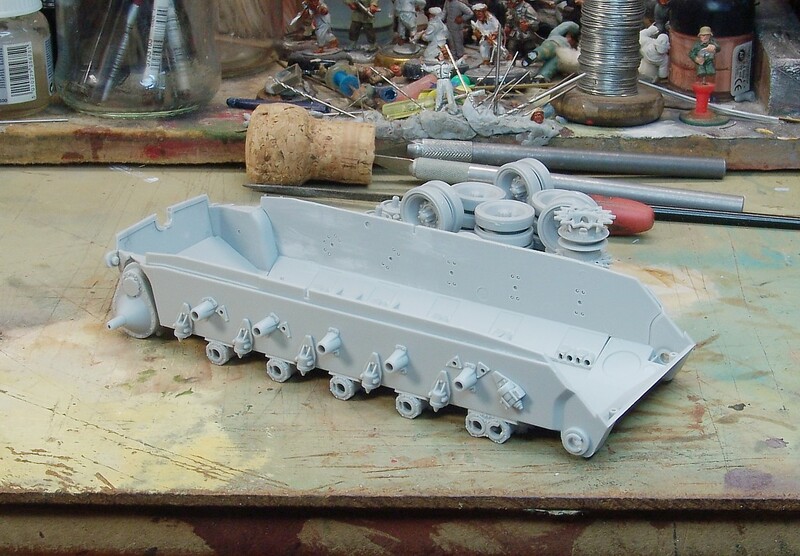 The only slight hassle involves the fitting of the plastic out hull parts to the metal hull monocoque. Super glue is required here and is unforgiving due to it’s rapid set time. 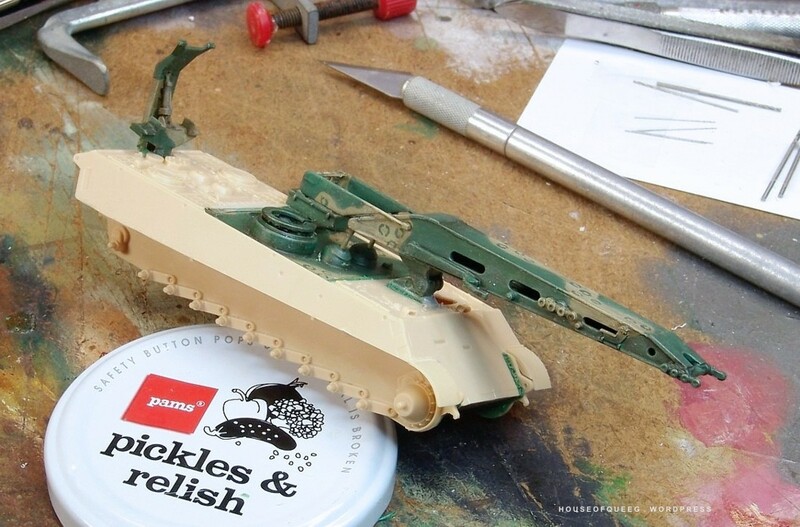 Superglue gel should really be used here … or better yet lets hope all new Tamiya kits have plastic hulls. Anyway fit of parts is good so far and with no issues. 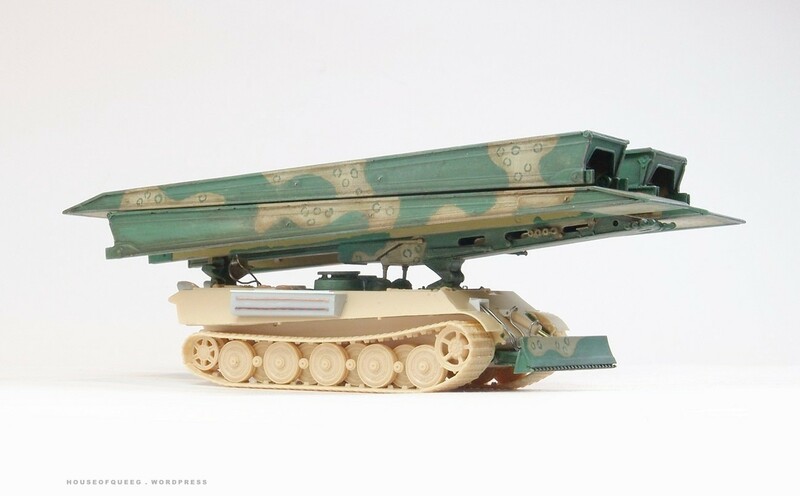 The Link and Length tracks fit well although this is the step where most care is required …. 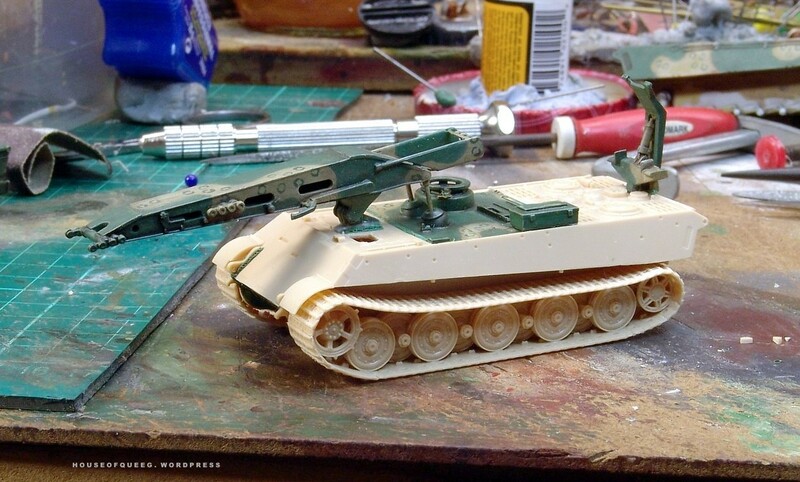 Managed to get in a little work on the Tamiya kits bigger brother. Not much progress yet but so far the fit of parts is good with no issues. 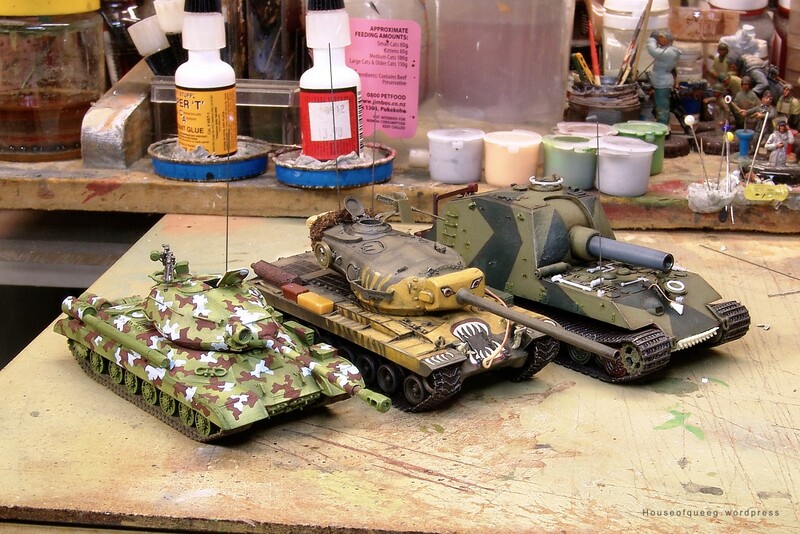 Another of my explorations into German E-Series development. 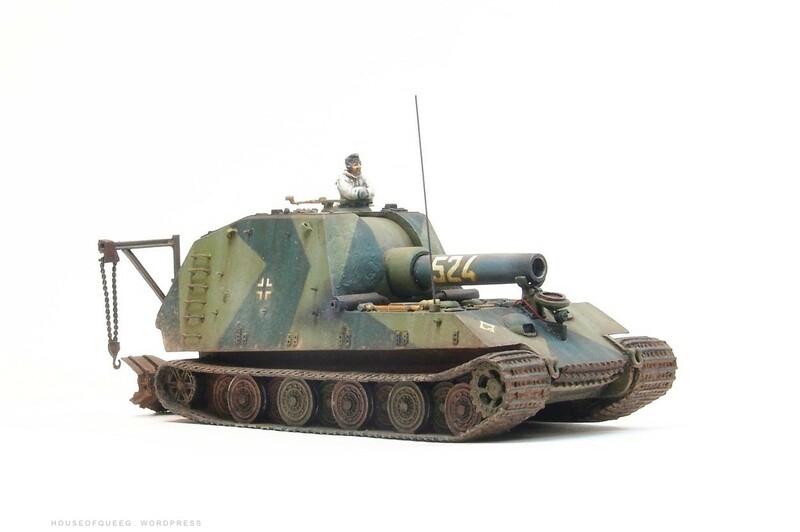 I’ve always liked the Swedish S-Tank partially from the concept/tech solution side and partly because it always reminded me of the German Jagdpanzers, especially the Hetzer and small E-Series ones (E-10 and E25). 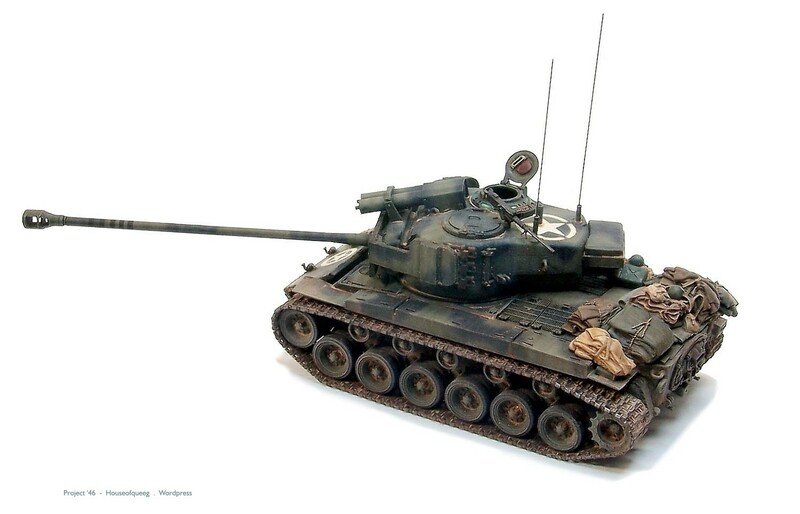 So I spent some time last year trolling the interwebs and looking at the S-Tank history and development. 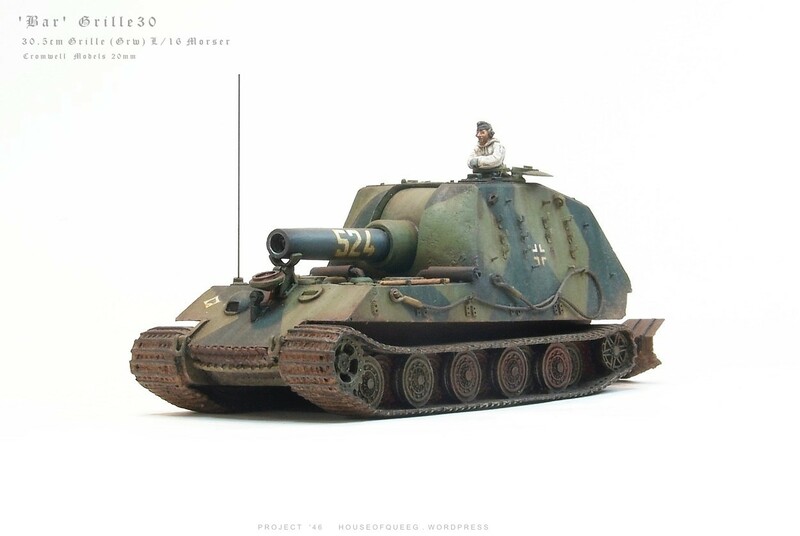 I liked the autoloader as a solution to mounting a bigger weapon on the smallest chassis possible and it fitted well with the German proposals. 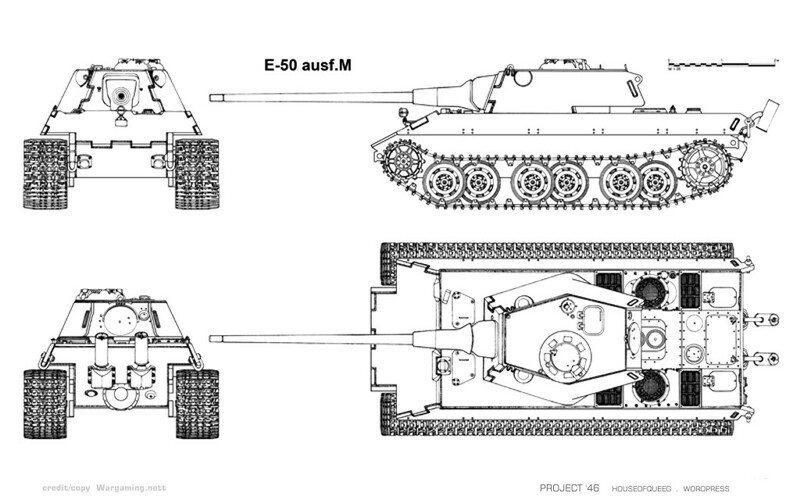 In addition to that the E-10 was proposed to have hydropneumatic suspension levelling, a system also adopted in the Strv 103 and the US MBT70 prototypes. 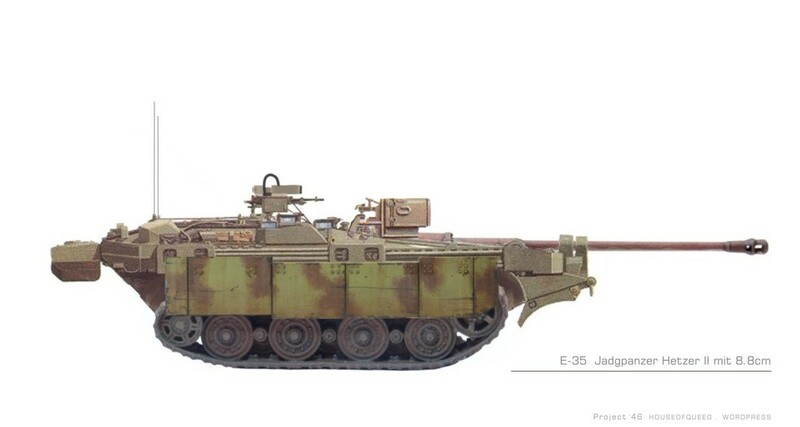 And so through the wonder of Photopaint here’s my concept for a Hetzer II 35ton E-Series Jadgpanzer. 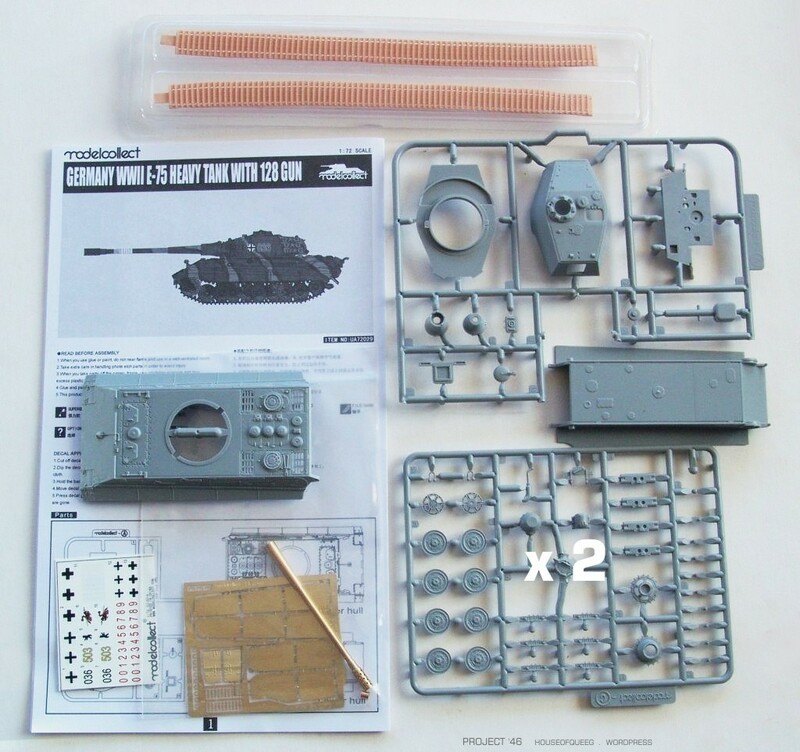 The plan is to combine a Trumpeter S-Tank (Strv 103c) with bits from a Revell Tiger II and a dash of gizmology thrown in …. 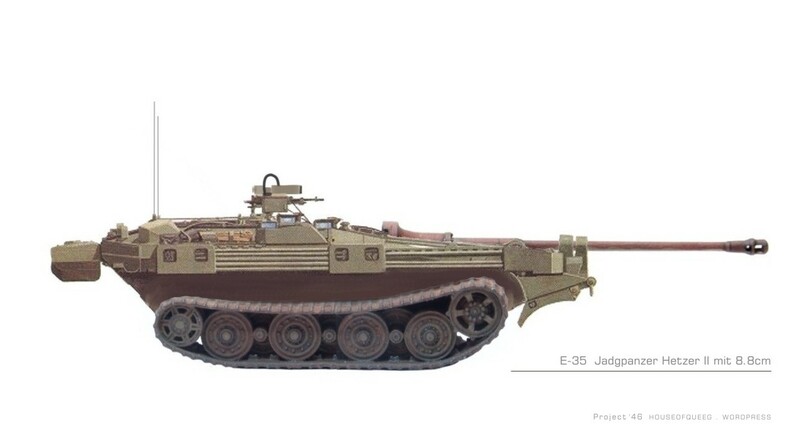 Just playing around with a decent design for the mythical Jadgpanther II development vehicle. 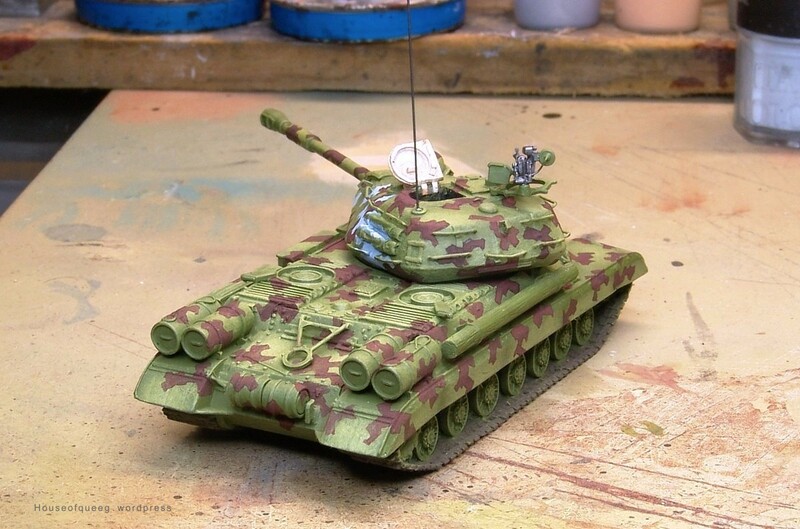 When doing my own designs I like to have a little bit (as much as you can with what-if scenarios) of practicality to them and as much as I like the E-50 and 75 series tanks some of the armament ticks the coolness box but wouldn’t work in practise. 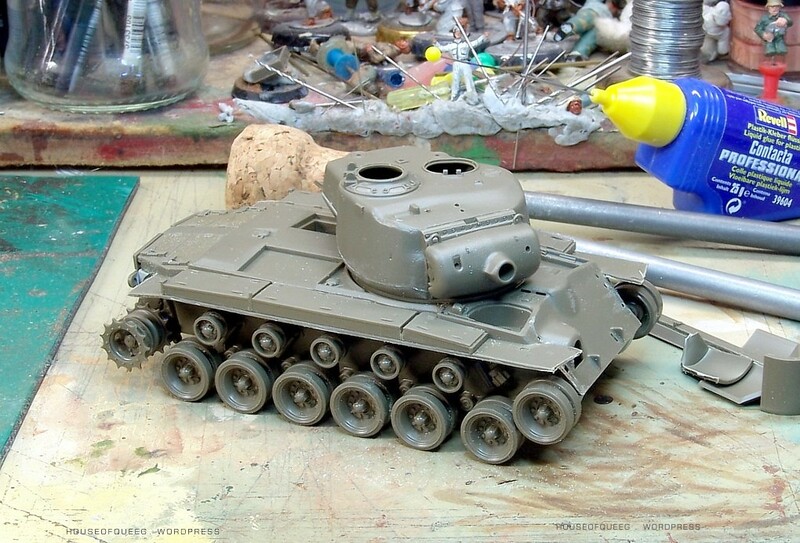 The E-75 12.8cm gun tank being a case in point as you just couldn’t fit the proposed weapon in there and have reasonable operating room. 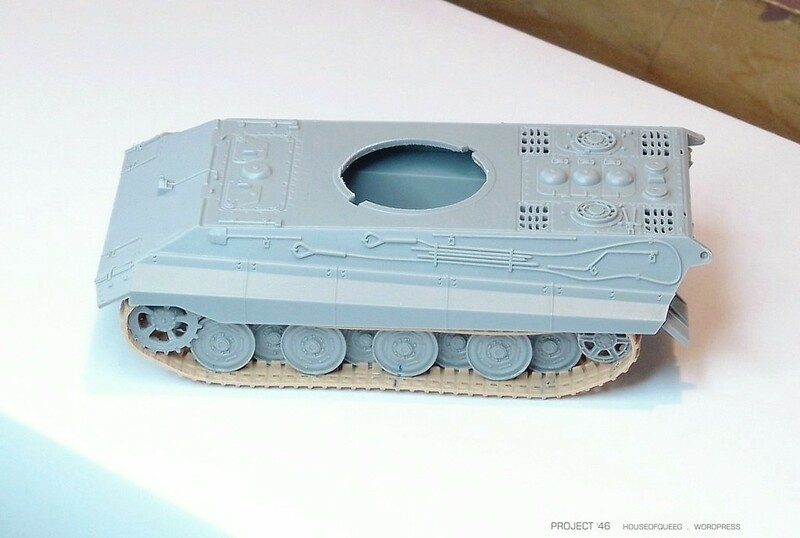 And so fitting the 12.8cm into a Panzerjager type chassis makes sense, if it’s also laid out in a way that the weapon and mechanicals make sense. 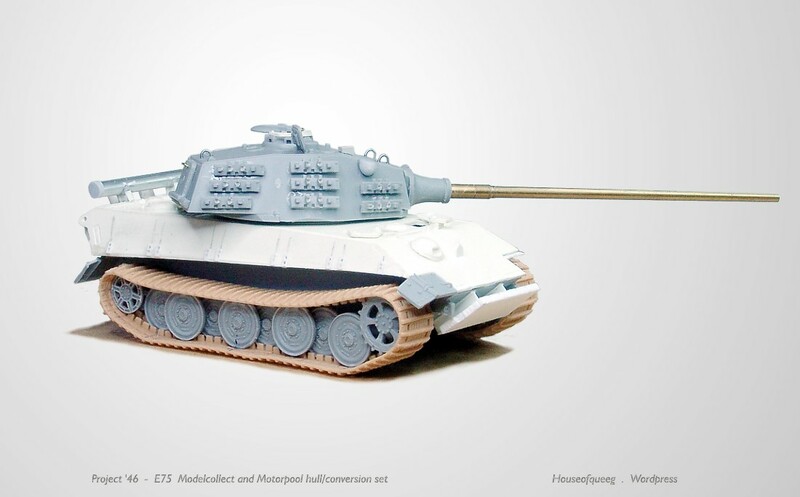 Most Jadgpanther II designs have a superstructure that is too narrow and short, having a similar cubic space as the TigerII turret fitted to the E-75. 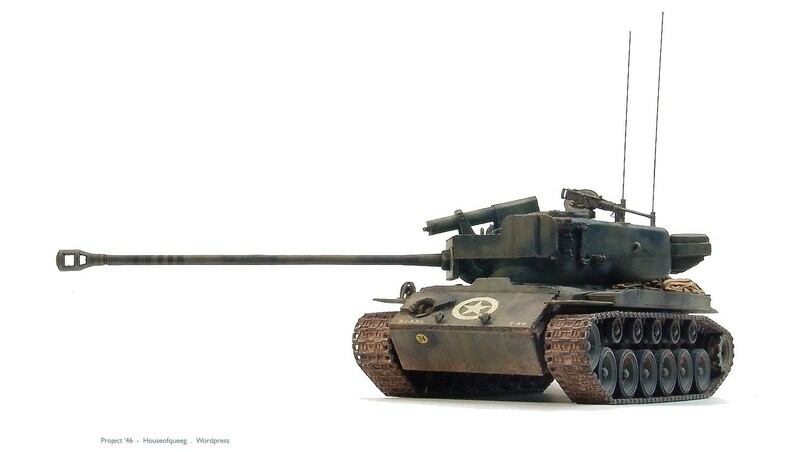 They also do things like pass the exhaust through to the back which is ergonomically a waste of space and are constrained by keeping 2 traditional driver and radio operator stations in the front hull. 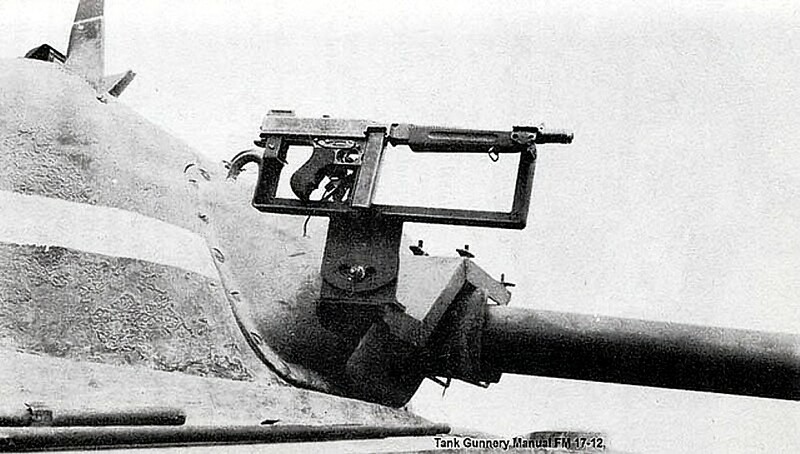 I think the radio op position would be better served for storing ammo or machinery in a revised layout. 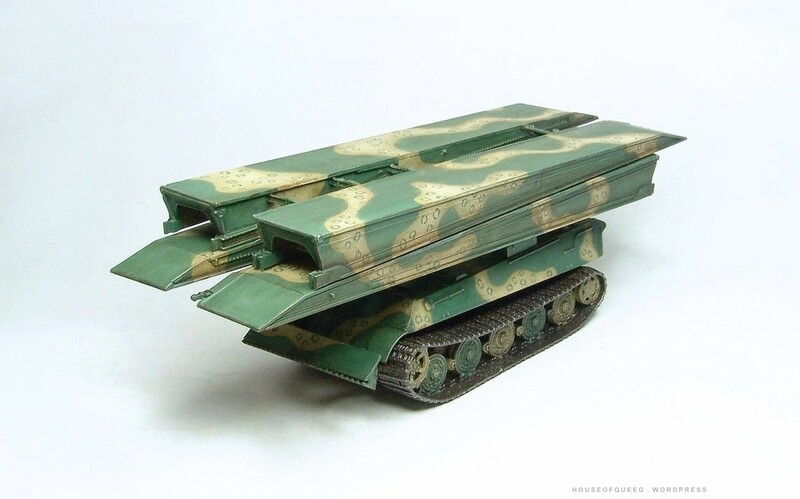 So in my design the upper hull has a length sufficient to fit and man the weapon, the driver sits semi-reclined in the front left hull and the engine and transmission is front mounted. 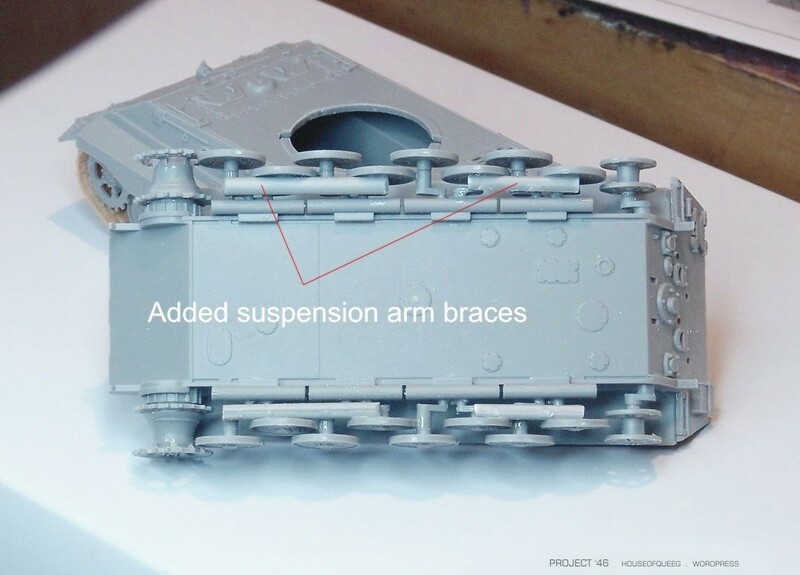 removing the radio op and reclining the driver allows the drive train to be lower reducing front hull height. 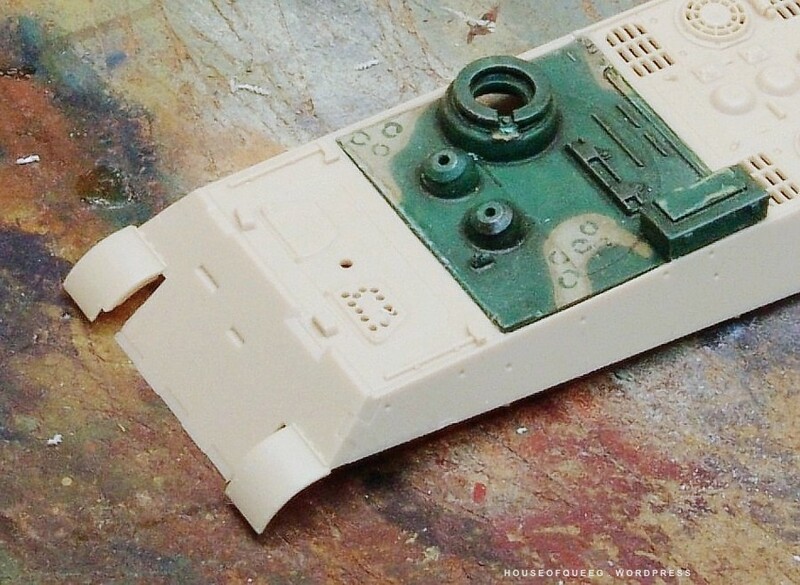 There will be a remote mg mount of the upper superstructure and a ball mount on the upper rear hull for self defence. Some actual build progress this time. So what are my impressions? I’d have to say I’m both impressed and a little disappointed. The moulding is high quality and they build easily. 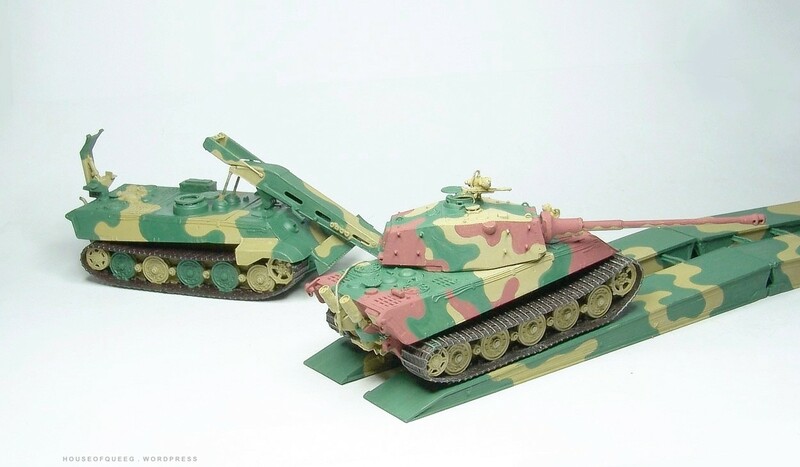 The DS tracks are very easy to work with (although mine were a little long and I trimmed off a few links) and the brass gun barrel and PE really adds some bling to the kits. 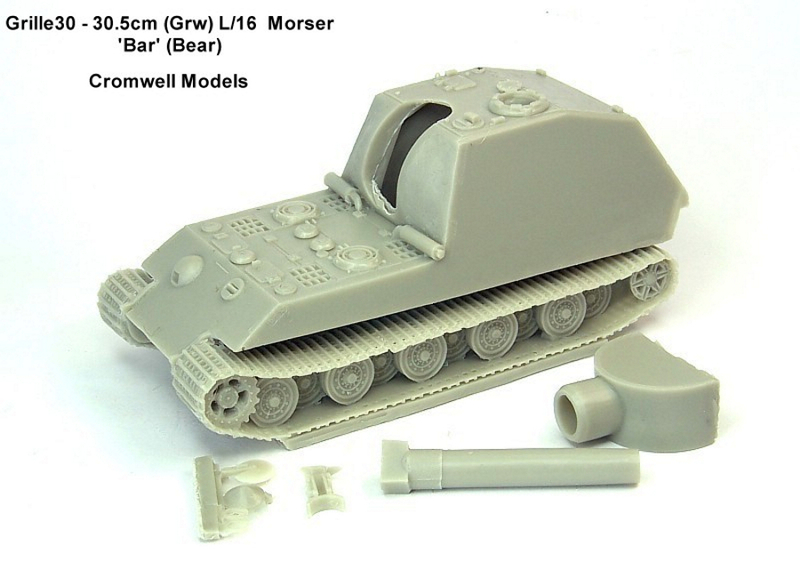 In other areas though they’re sort of an “almost” kit with simplified moulded on details. The suspension would be a little fiddly and fragile for some builders I suspect. 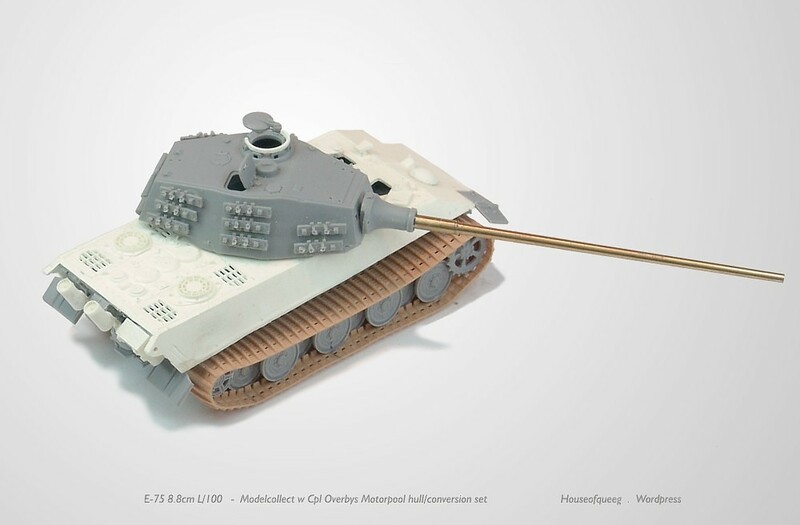 The arms that most manufactures would have moulded solid are separate possibly due to moulding limitations. 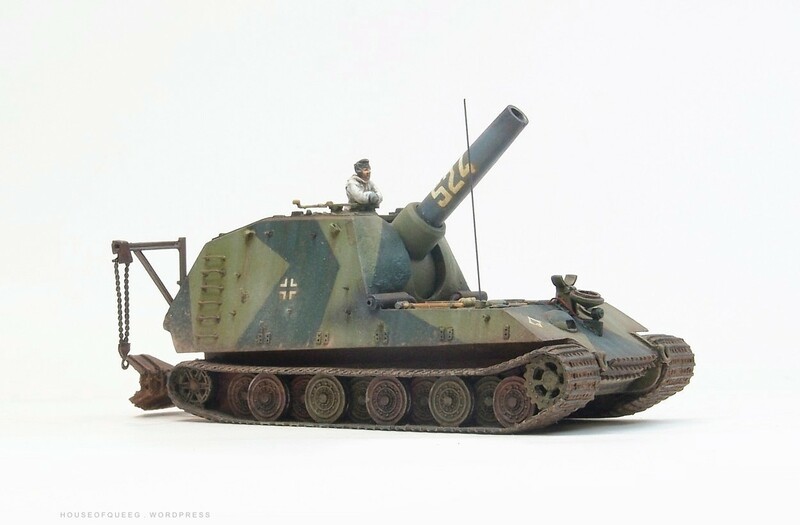 The weakness isn’t helped by the E75s (and E50s) single roadwheel configuration on the first and last suspension arm stations. 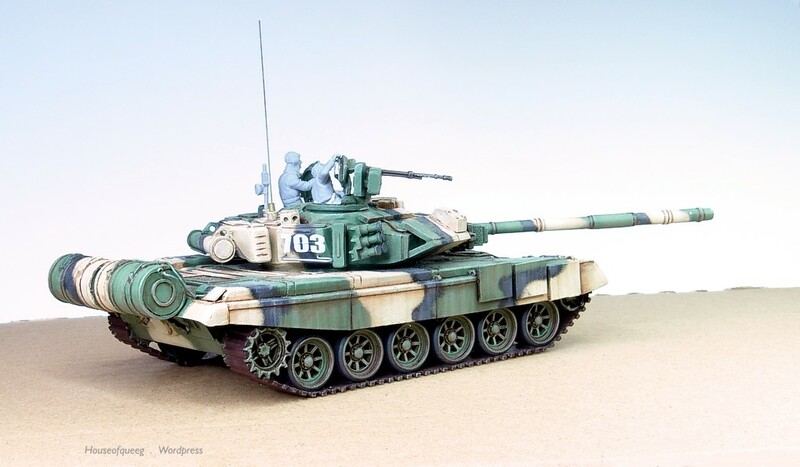 One thing that niggles at me is when kit wheels don’t sit flat and pull up because they aren’t strong enough to support the tension of the track. 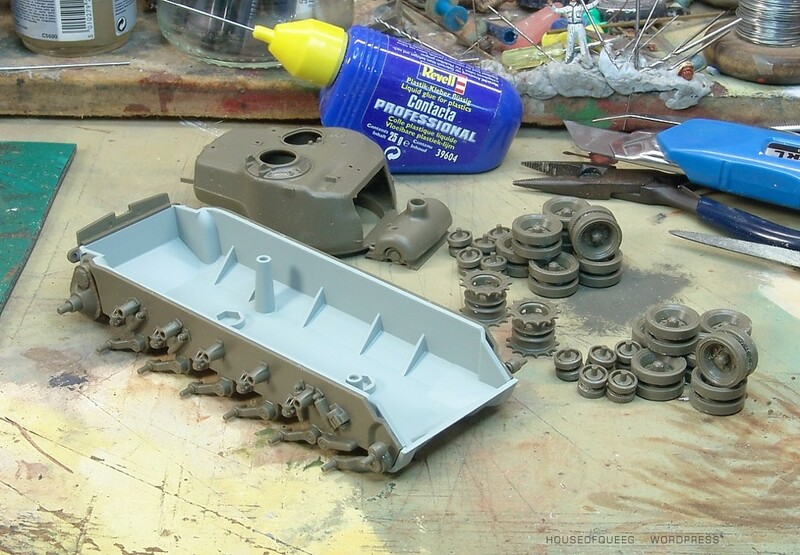 So after building the first chassis I glued scrap sprue “stiffiners” underneath the suspension units making sure the first and last arms were braced. 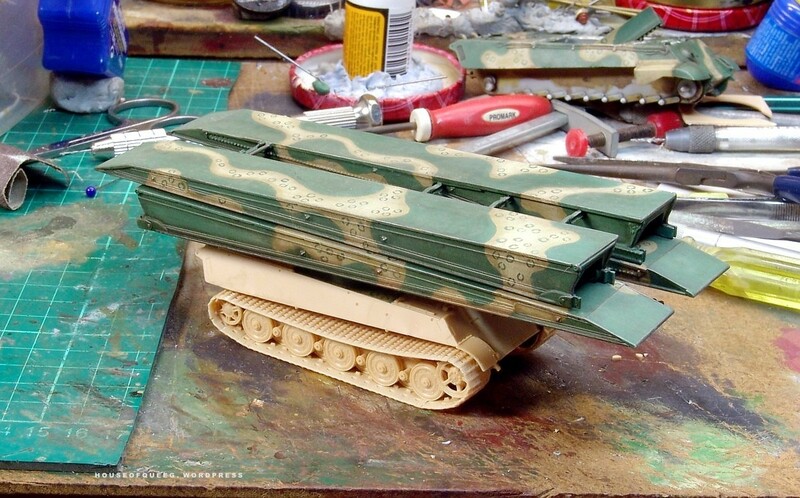 Once set solid they stayed firm when fitting tracks to the other three vehicles …. 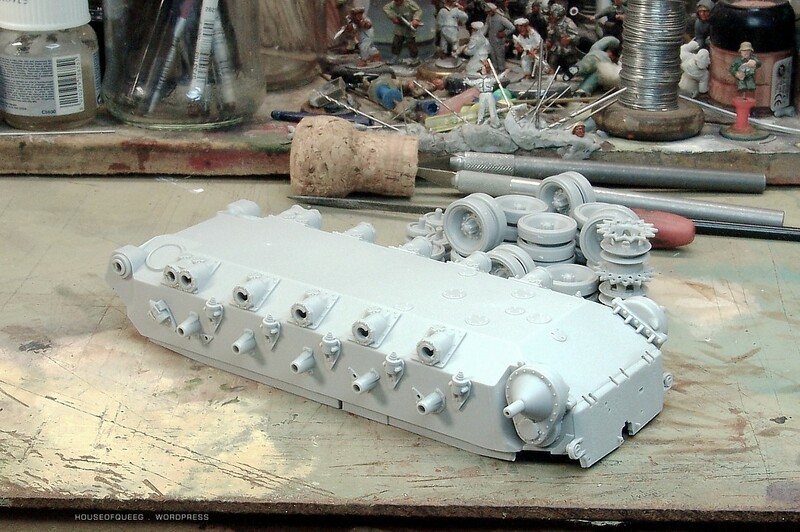 All tools including the prominent tow ropes are moulded on. While crisp they are undersized and a but spindly. A slightly thicker moulding would have helped them stand out and allow them to be undercut with a scalpel blade. 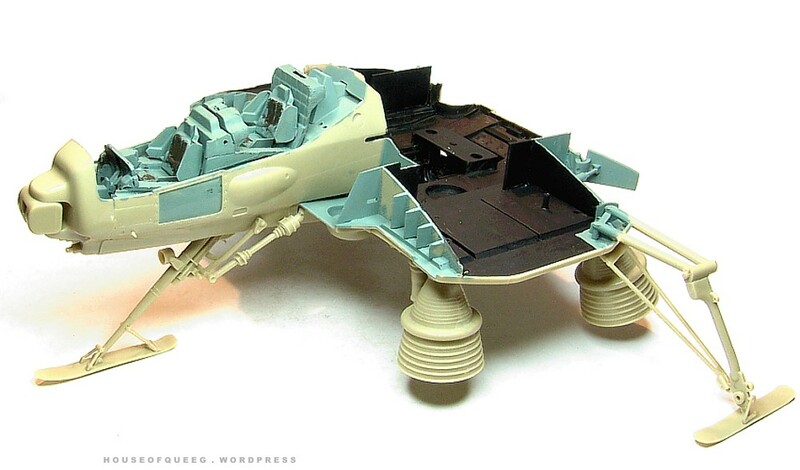 Basically for me this feature is a no-no and I removed the lot, to be replaced with wire and left overs from other kits. 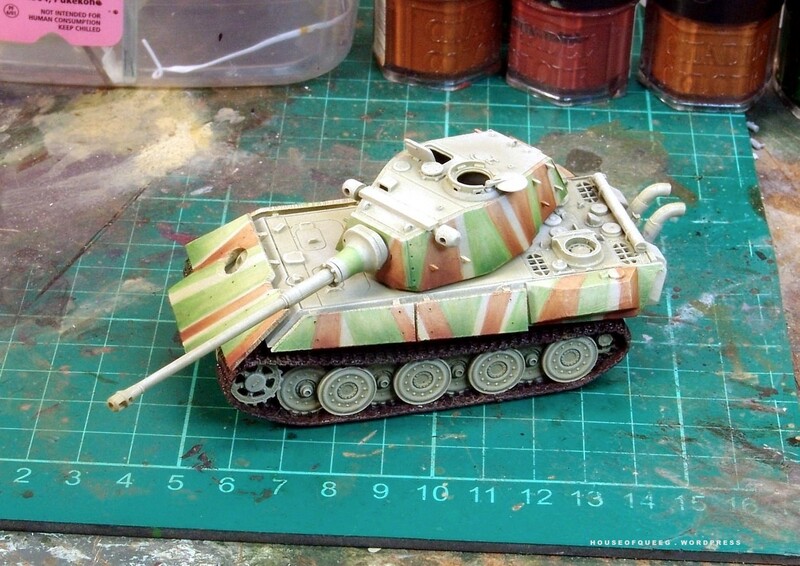 In a similar trend some other features seem a tad undersized but might not be noticeable under paint. 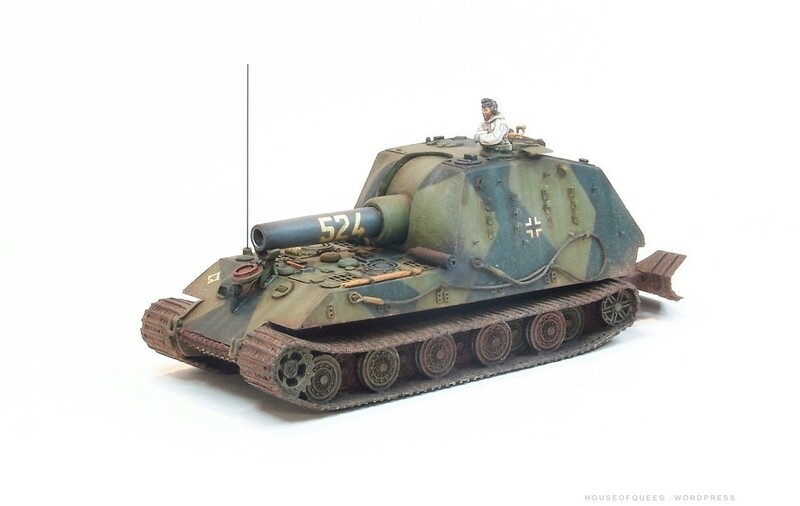 Gnarly E-75 zug . 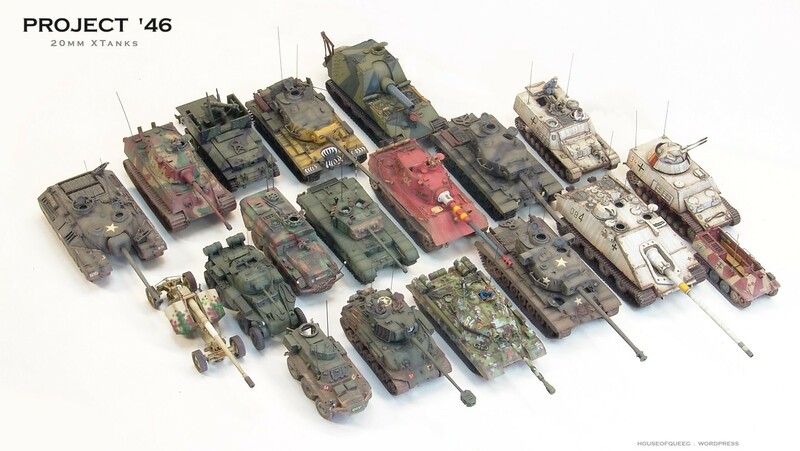 . .
And yes, more tanks. 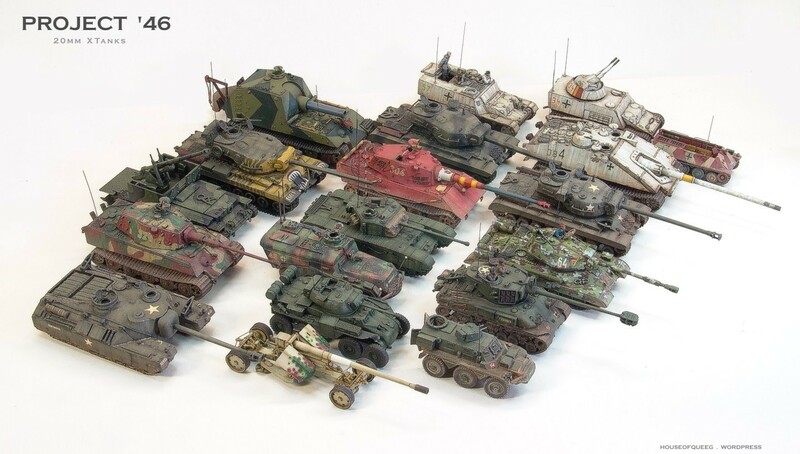 This time a Modelcollect E-75 platoon (or more correctly “zug”) of two 12.8cm vehicles and for a bit of variety two 8.8cm L/100 vehicles. 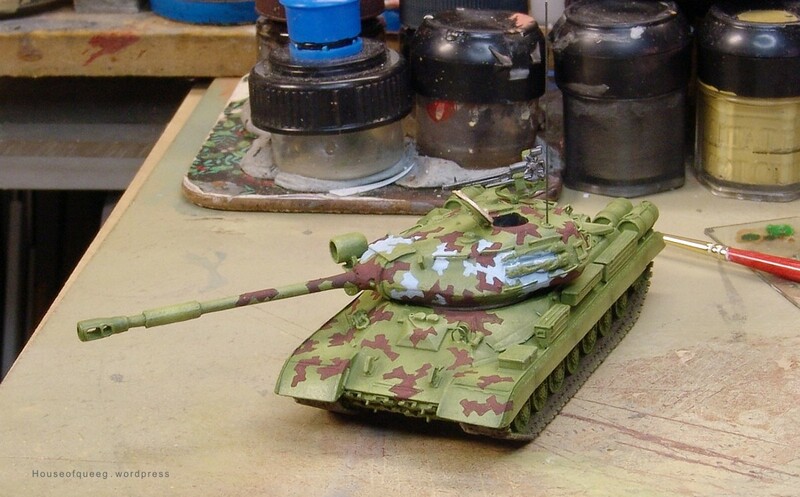 Ever since Modelcollect announced it’s “E” series tanks (and there’s an E-100 on the way too) I’ve been wanting to get one to have a bash at it. 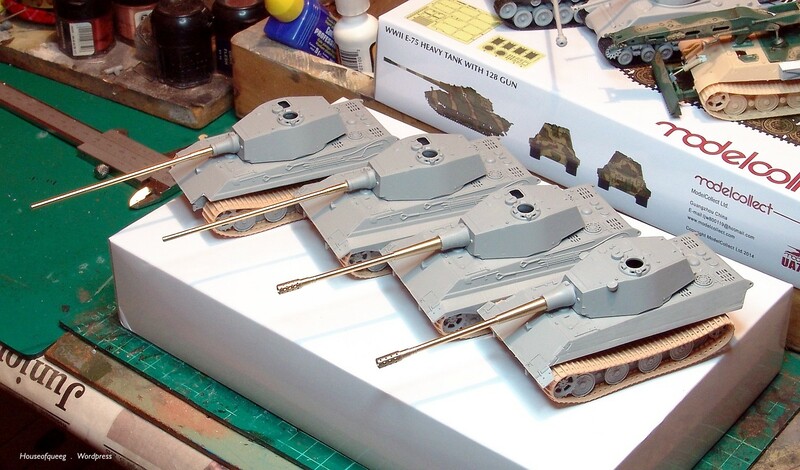 Prompted by the SABOT game project, instead of one E-75 my brother “gifted” me a platoon of four to assemble! 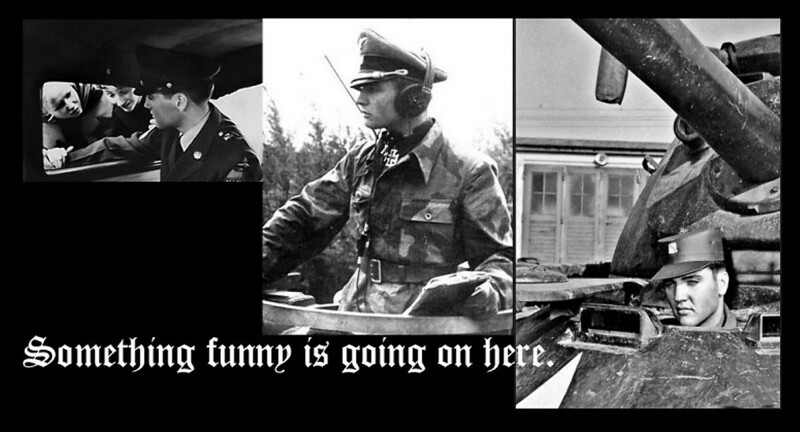 Firstly a bit of history (yes I can hear the groans over the interwebs). 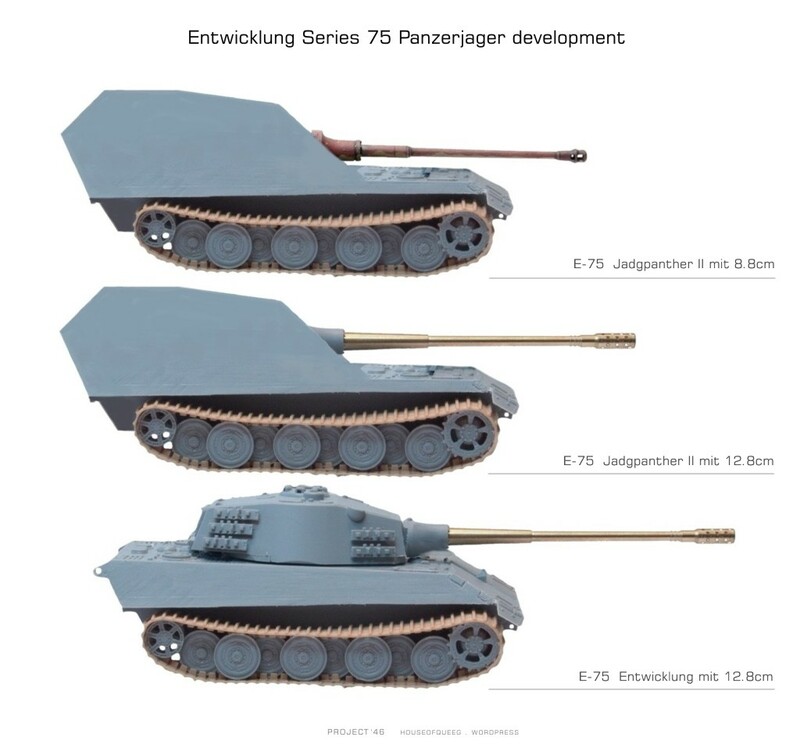 So keeping it brief, the E series was a proposed streamlining of German tank design allowing more commonality of parts , simplified designs where possible with they goals of improving protection, armaments and streamlining production. 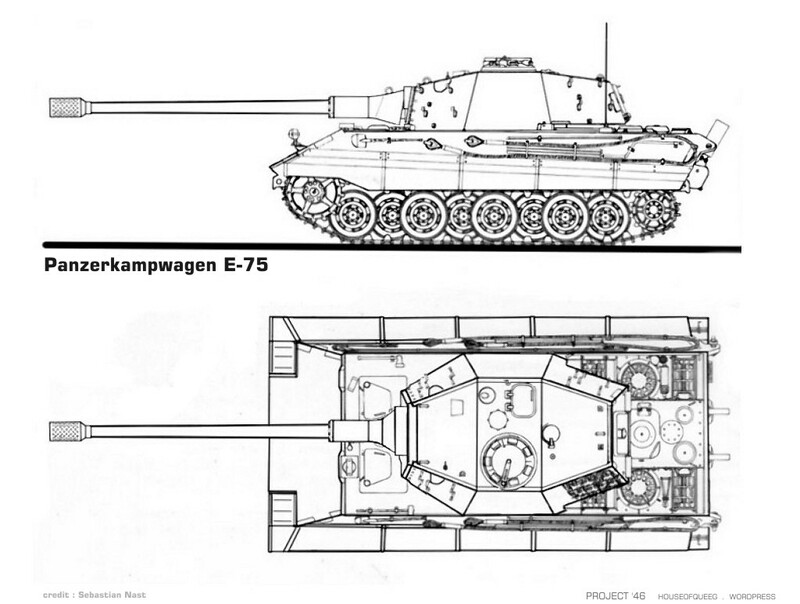 The E-75 was to share as many components as was practical with the lighter E-50 and both designs were visually similar to the Tiger II. 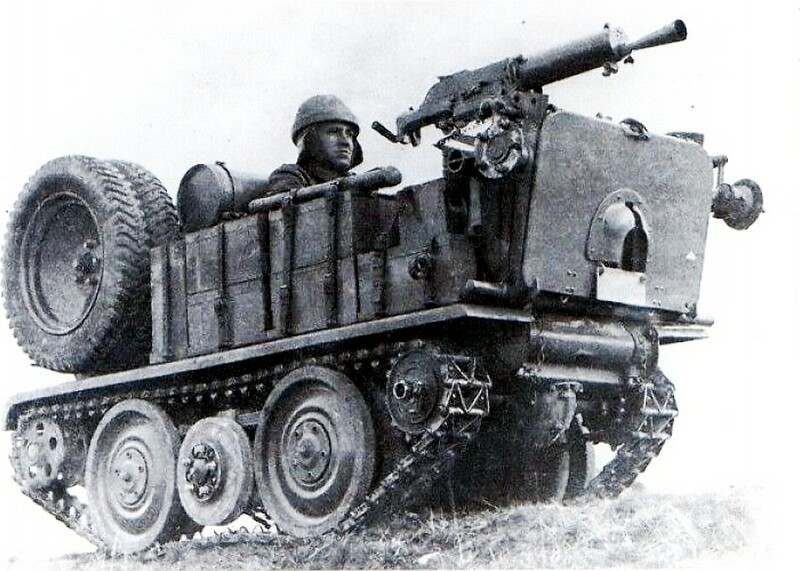 A unique feature as proposed was to have rear drive so as to reduce drive train vunerablity and improve both weight distribution and maintenance/access. 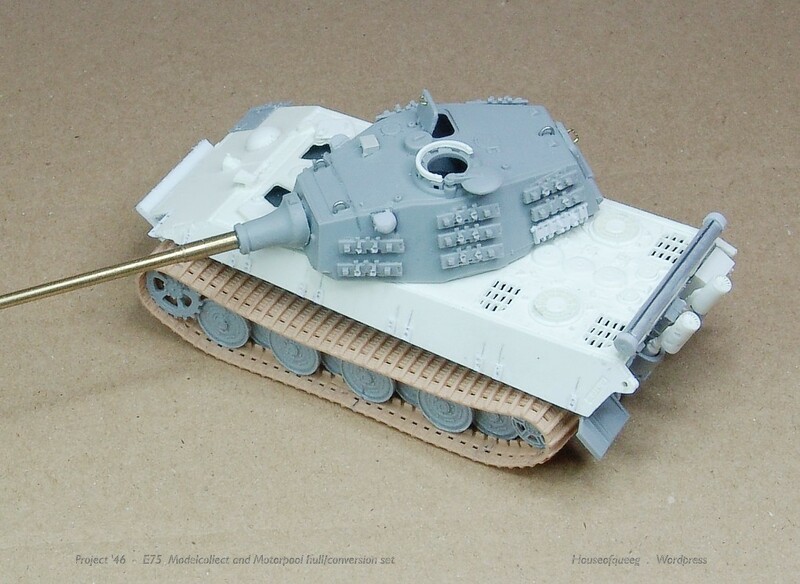 This feature presented many technical difficulties and the Modelcollect E-75 uses the standard “Tiger II” front drive and automotive layout. 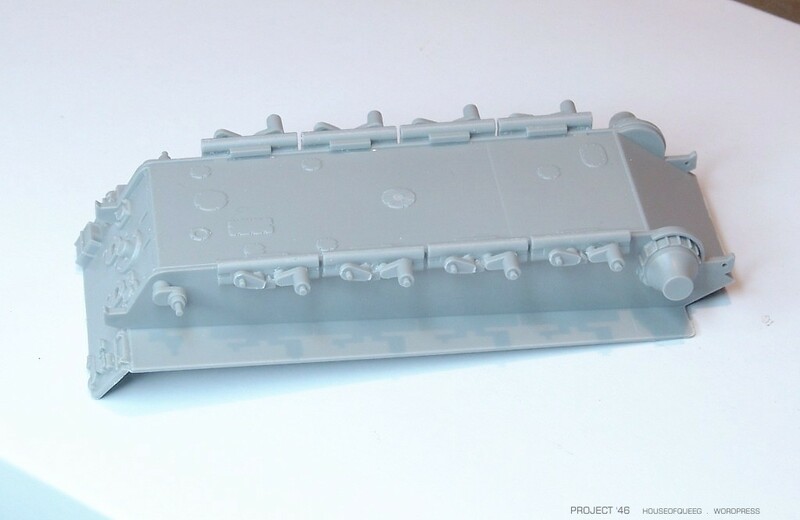 This layout is most likely to have been used as an interim solution until the rear drive technical issues could be solved. 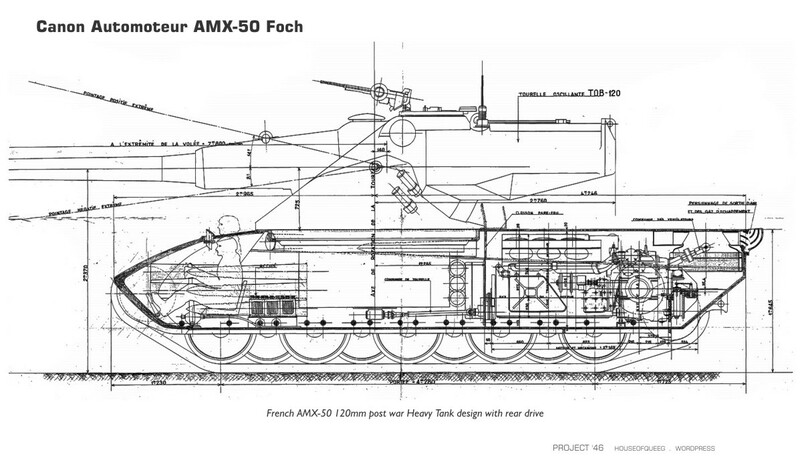 Interestingly French postwar tank design was heavily influenced by German designs and also assisted by German Engineers. 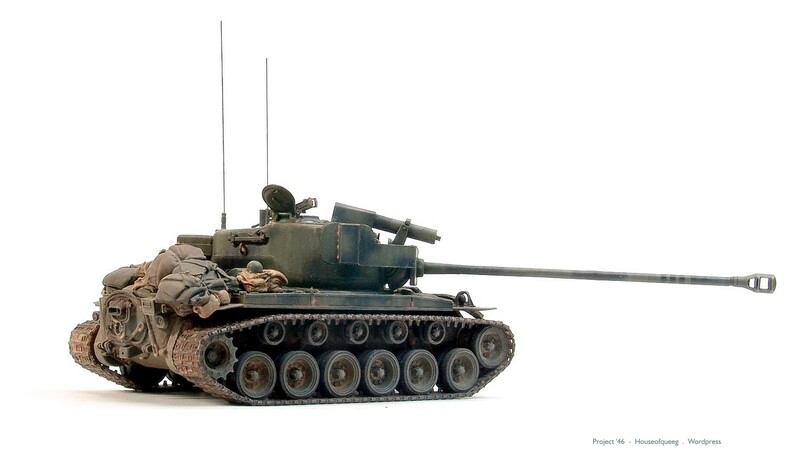 The AMX50 utilised rear drive in a format very much like that envisioned for the E50/75 series tanks. 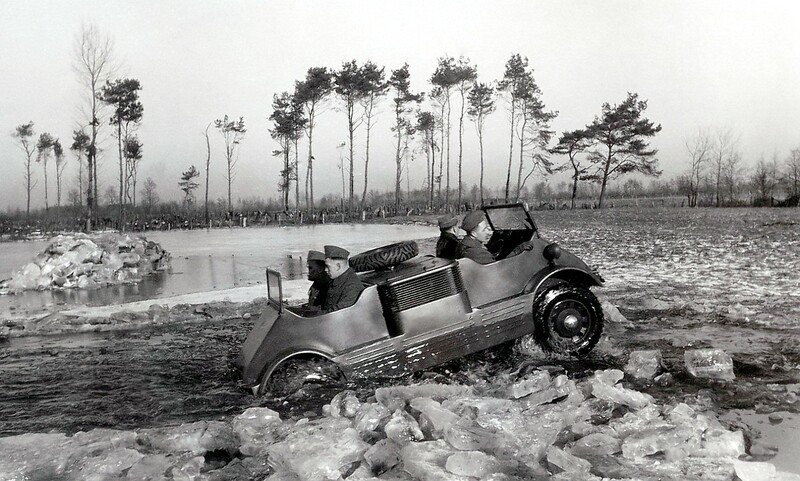 The resulting design was longer at the rear to accommodate both the engine (a Maybach design) and the transmission. 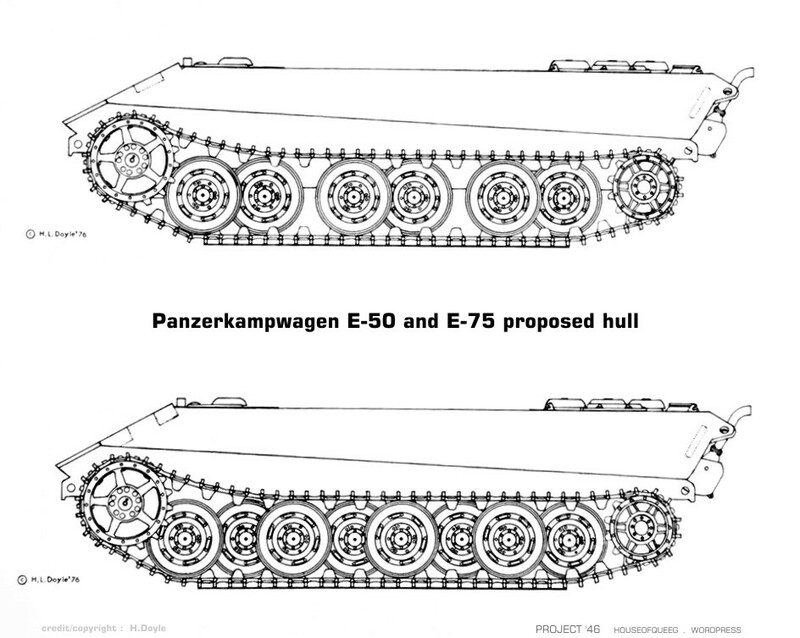 The few existing original German WWII era design proposals do not allow sufficient length to allow rear drive in practical terms and it is likely that the final E50/75 series may have looked significantly different from most designs found on the web today. 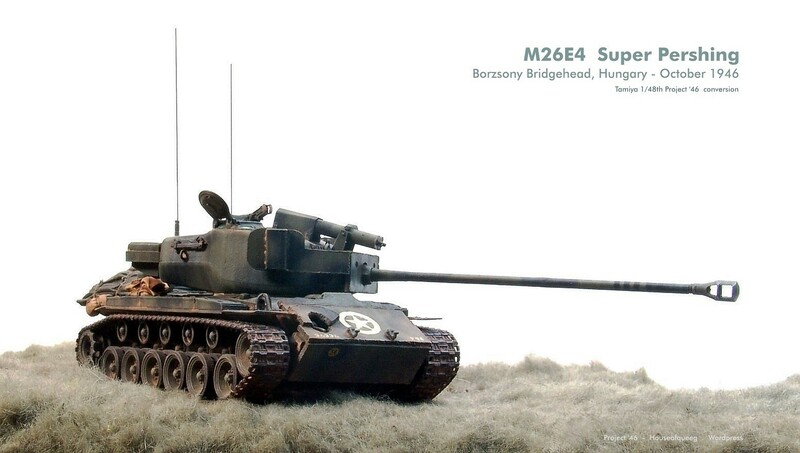 Another key feature was the adoption of externally mounted suspension, the resultant space gained by removal of the torsion bars used to increase internal storage, lower the vehicles and would have allowed for floor mounted escape hatches. 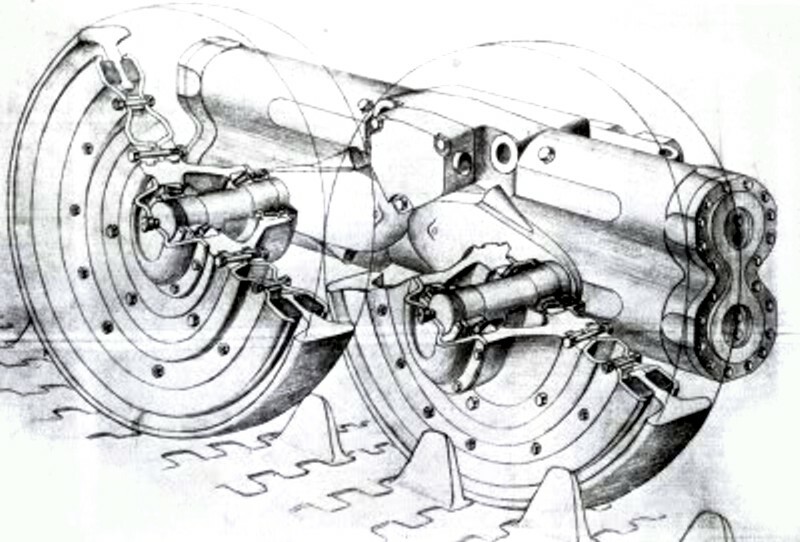 The system proposed used “Bellville” or stacked conical washer like springs and was intended to reduce both the complexity and un-sprung suspension weight while retaining the load bearing qualities of the larger interleaved torsion bar system. 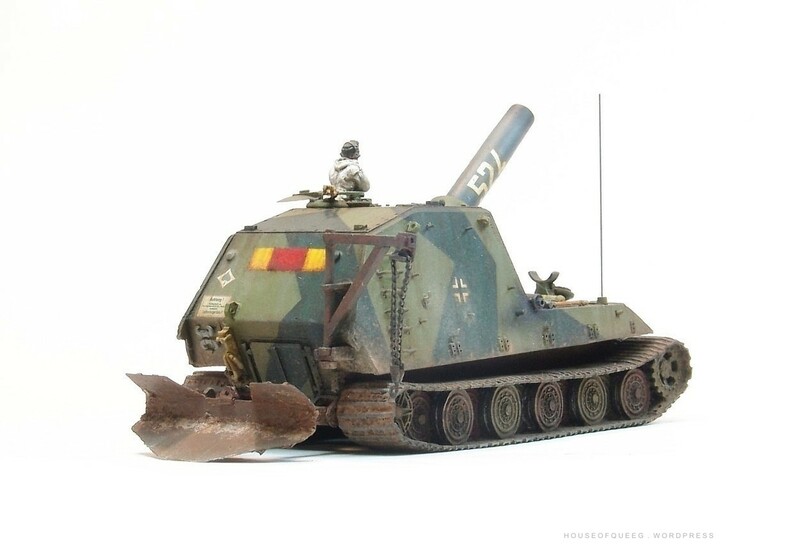 The Belleville Spring Washer system was used on the post war Swiss designed Panzer61 and is still used in some Formula 1 suspension applications. 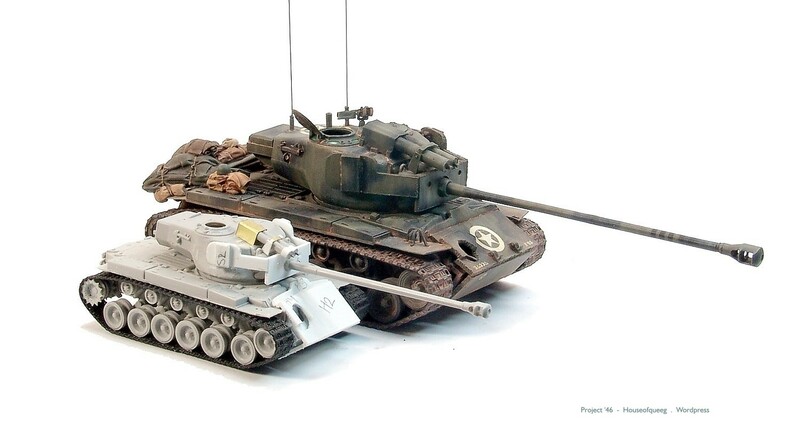 E50 and E75 hull designs with rear drive. 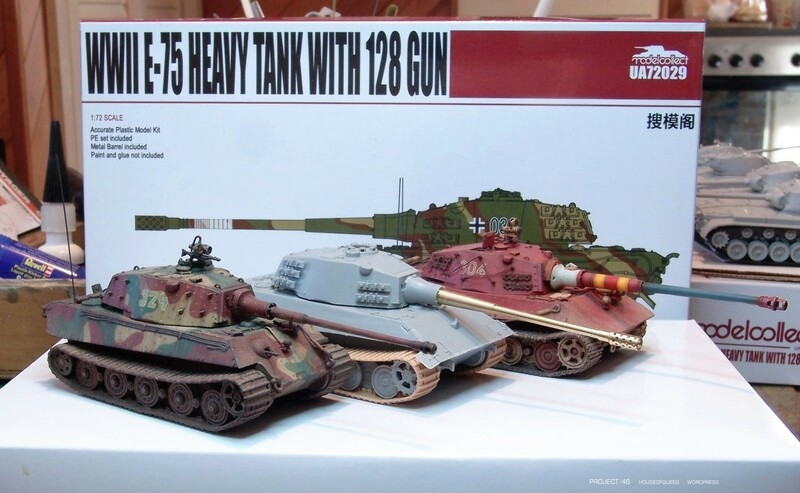 Common impressions of what the Heavy E series tanks would have looked like. A little something to celebrate getting 100K site visits a little while back …. Some things just can’t be rationally explained especially when the military mind is allowed full reign to express itself. 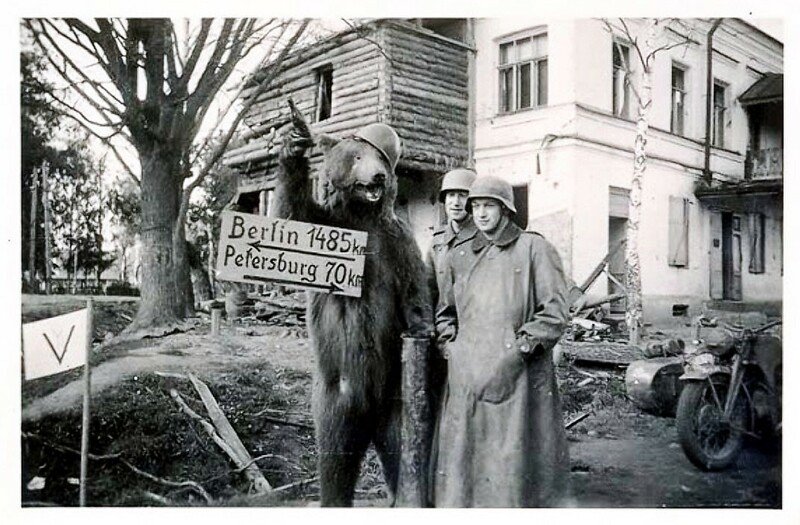 The result is weird costumes, unusual camouflage and completely impractical vehicles. 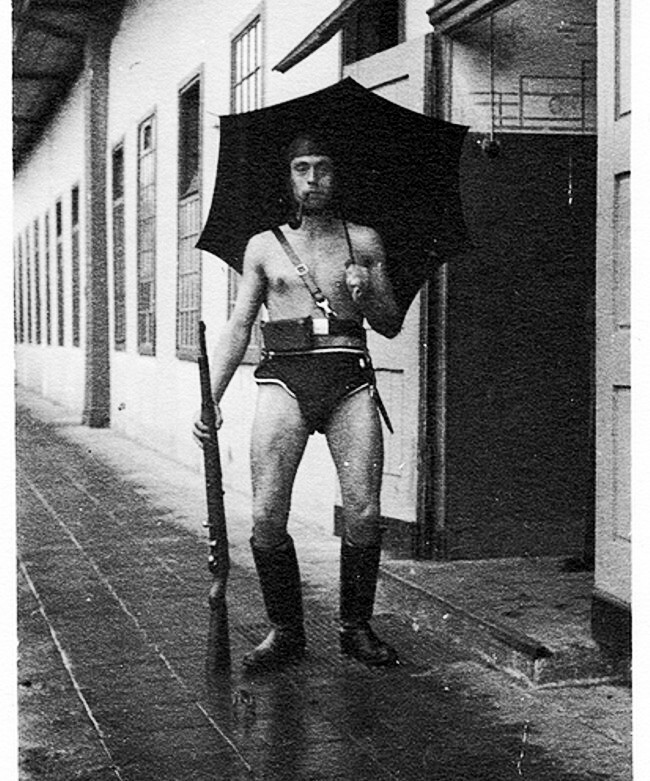 Just for funsies I thought I’d post a few pics from my web collection of military weirdness of the highest order …. 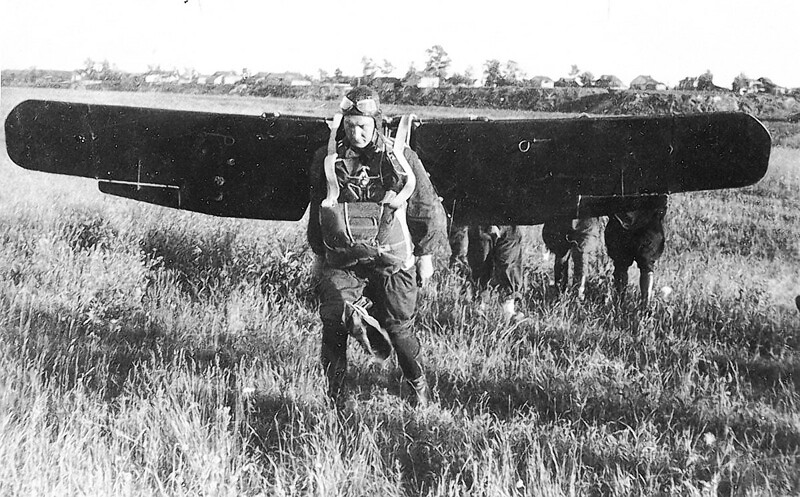 VWW Prototype, as the marketing pamphlet says, “not just an amphibious car but a unidirectional amphibious car!” No orders were placed …..
A chronic shortage of imported silk fuelled this design from ill-fated Soviet aeronaut Sergi Stupoiovich, seen here preparing for his first, and last, test flight of the assualt manbatwing. 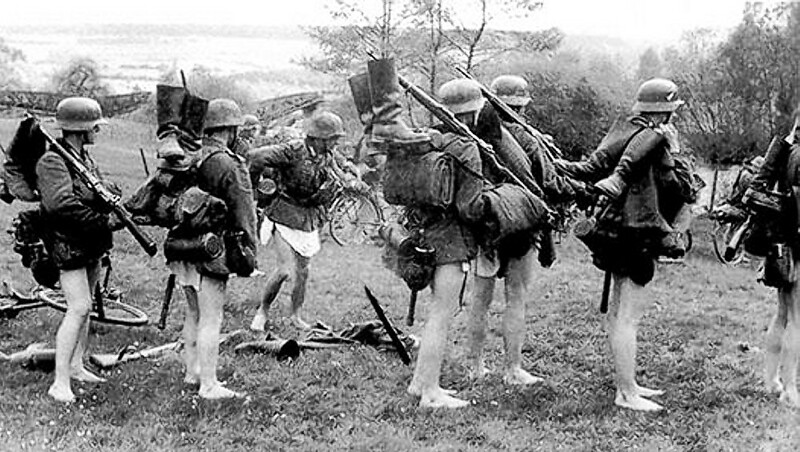 The 1940 German Albert Canal swim team seen here in a secret training session. The famous ‘Wake Island TD” often thought to be a military urban legend until this recent archival photographic discovery. 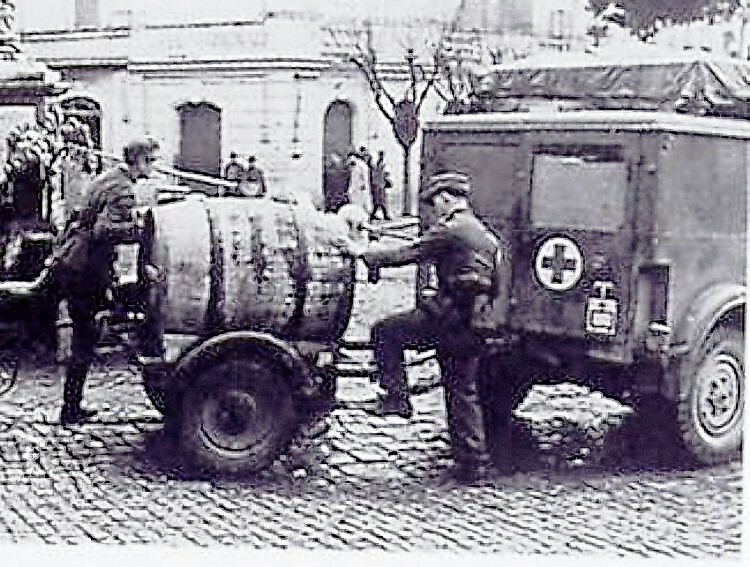 Wash day during the phoney war Sitzkrieg of 1939. 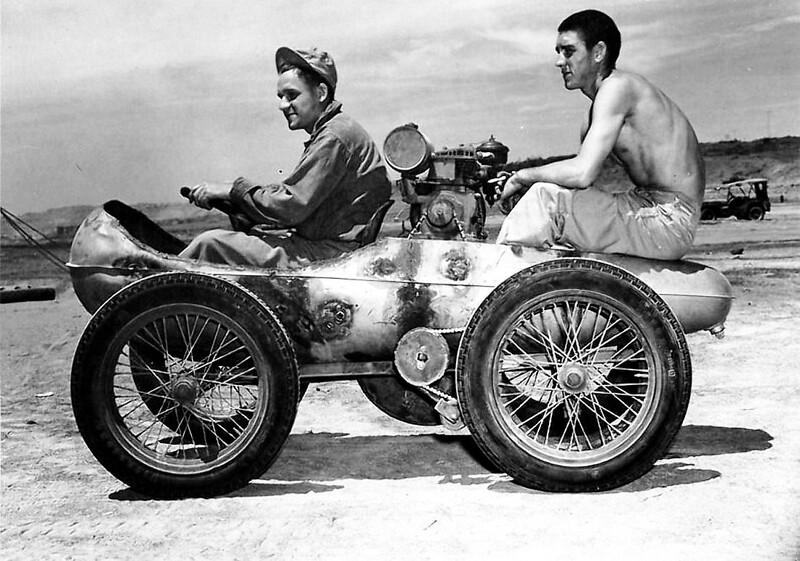 2 man Northrop-Grumman 75 Gallon Droptank cycle. Elvis ….. the man is everywhere. Nuff said. Dave goes undercover. 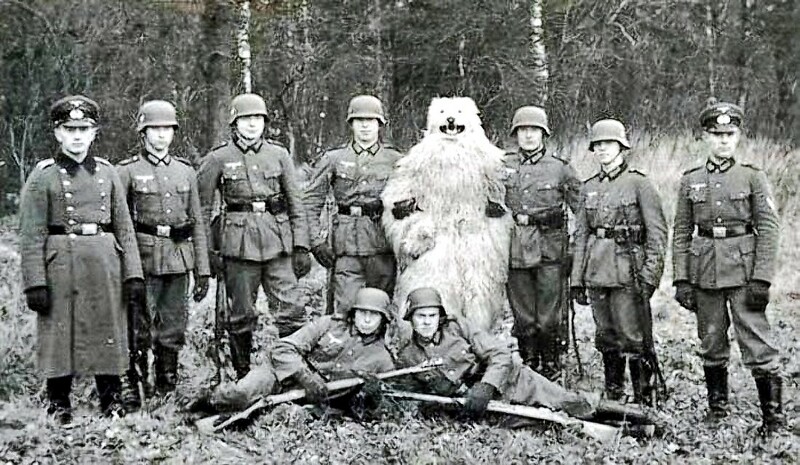 Superb costume partially let down by his failure to find a suitable Bear cavalry unit to blend with. No idea. So it must be something to do with excessive schnapps consumption. Obvious really. 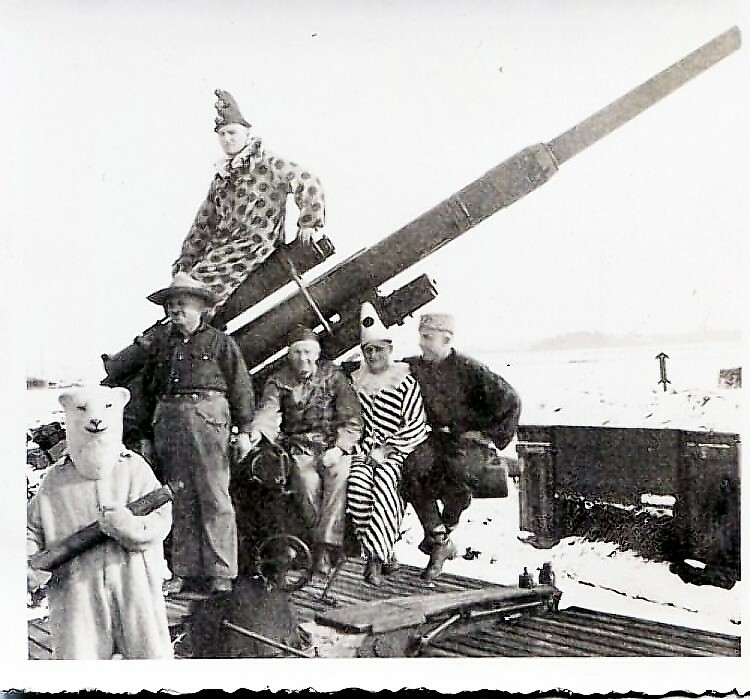 ICP European fun tour ’42. 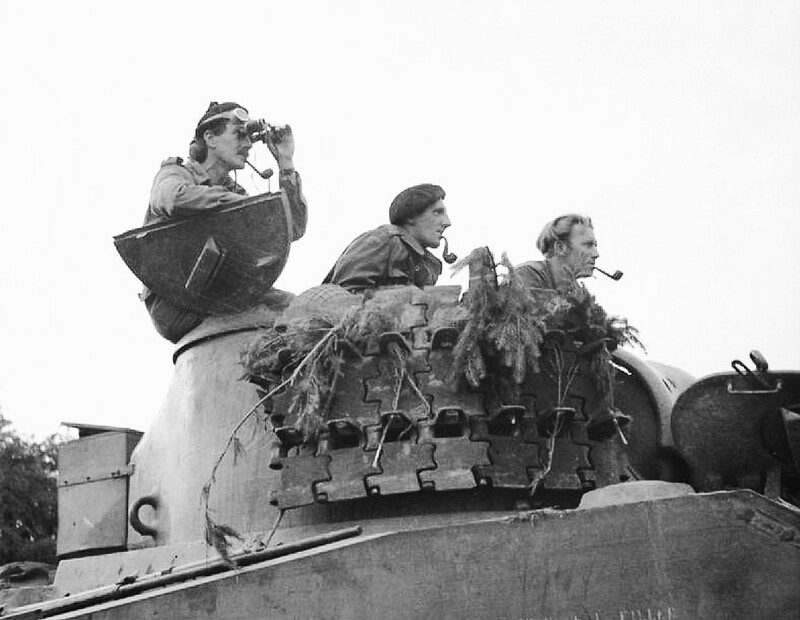 The famous British stiff upper lip and disdain for danger is evident in this picture of a tank crew fortified with cucumber sandwiches, gin and pipe tobacco …. 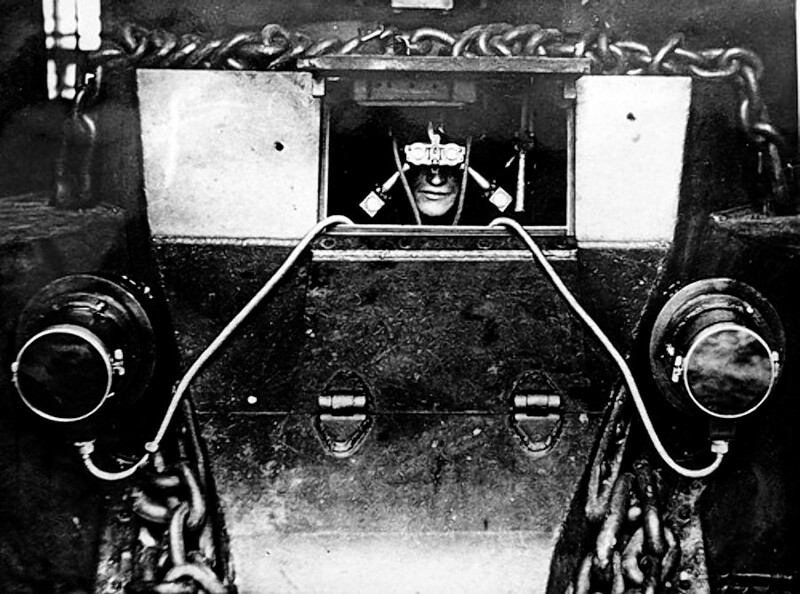 Top secret War Dept field testing picture of the Vickers-Armstrongs “Cateye” image enlarging bifocals seen here attached to a “volunteer”. 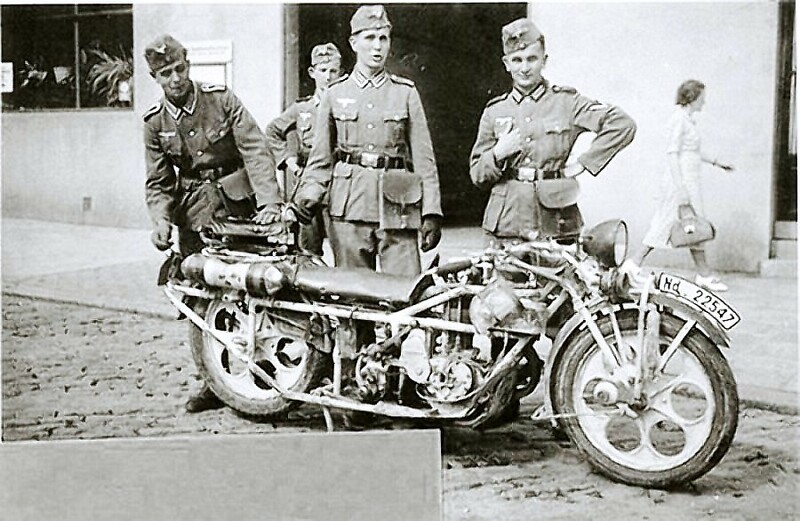 Focke-Wulf Kradschutzenskooter parked outside a coffeehaus and being admired by envious footsloggers. 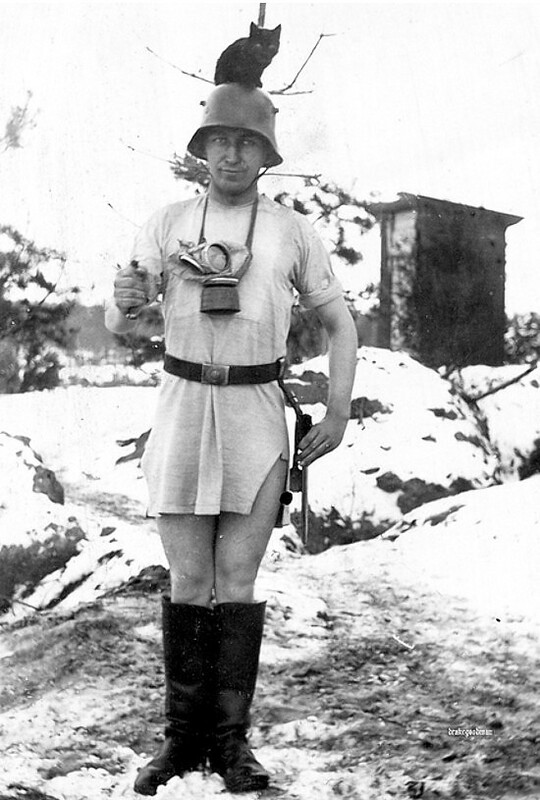 Dave undercover again, this time spotted here trying to infiltrate the temporary field HQ of OKW East during Operation Caseblue (Fall Blau). 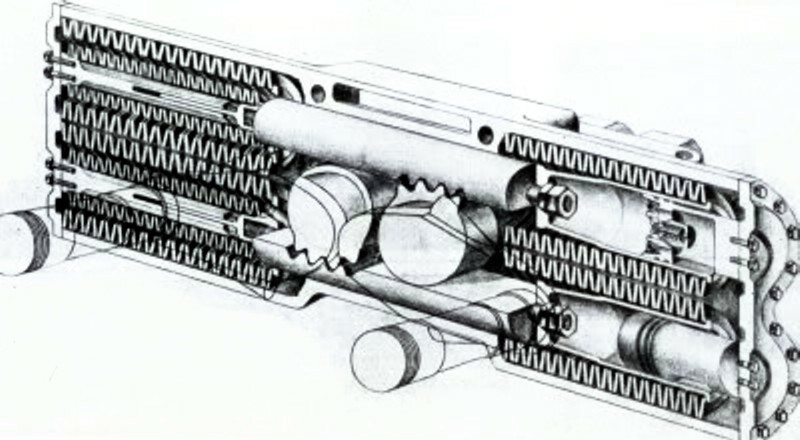 Oddballs design for a co-axial Thompson (Pat:Pending). 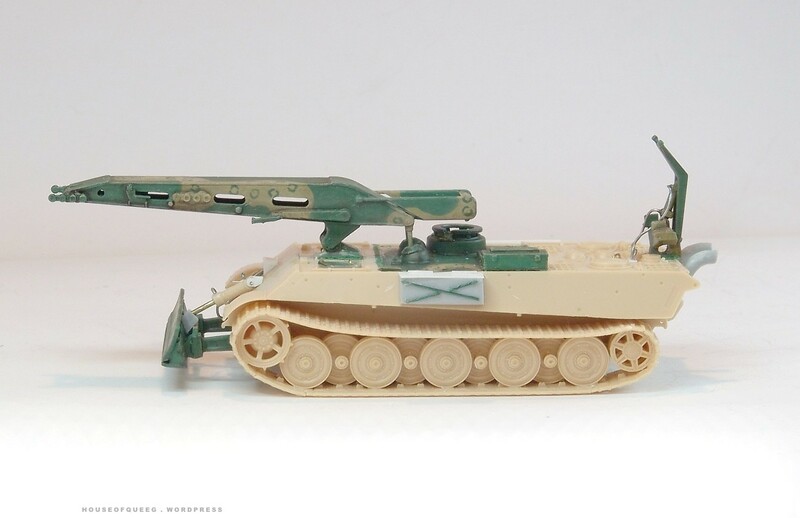 Limited ammunition capacity caused this promising weapon to be relegated to rear area and training units only. 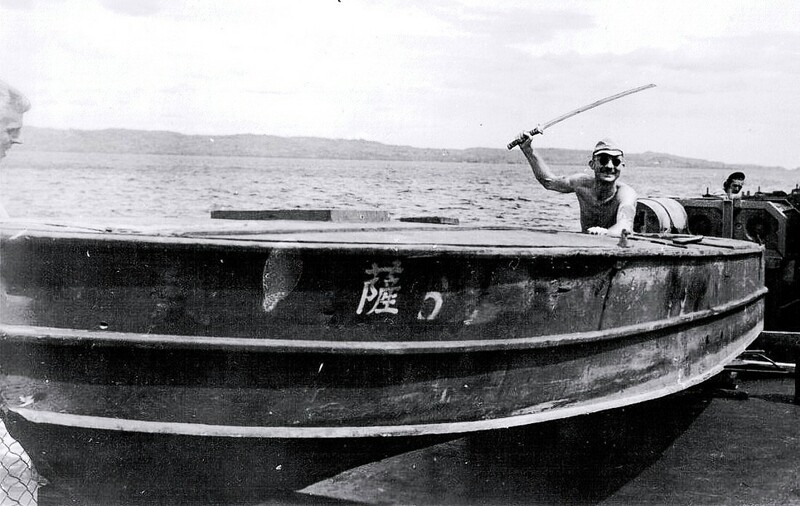 The infamous “Bambookatana” one man attack boat was fuelled by 100 octane av-gas. 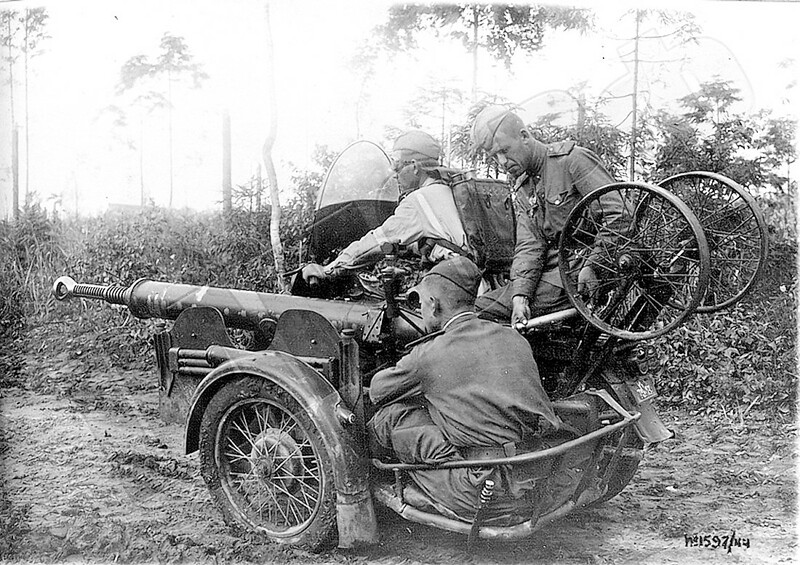 First Lt Hiro on the other hand is seen here running on 40 proof Sake …..
Norwegian entry into the 1932 Eurotank (single man, powered) open class category competition. 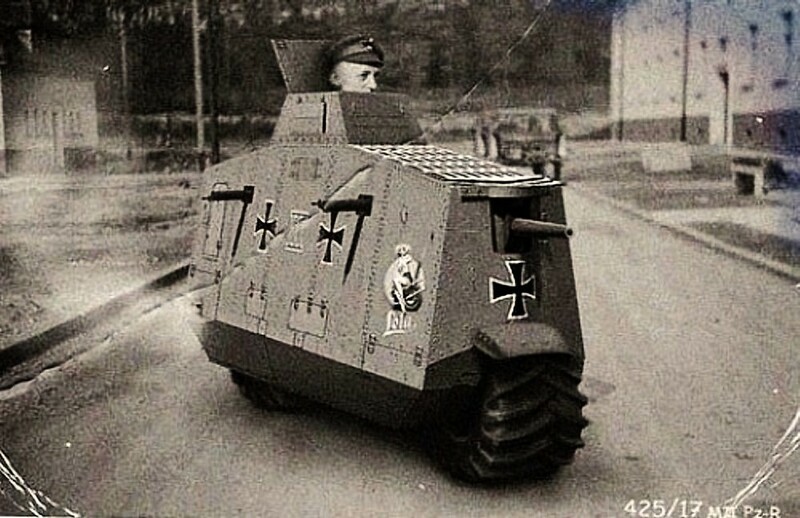 A7V Funtserwagen. 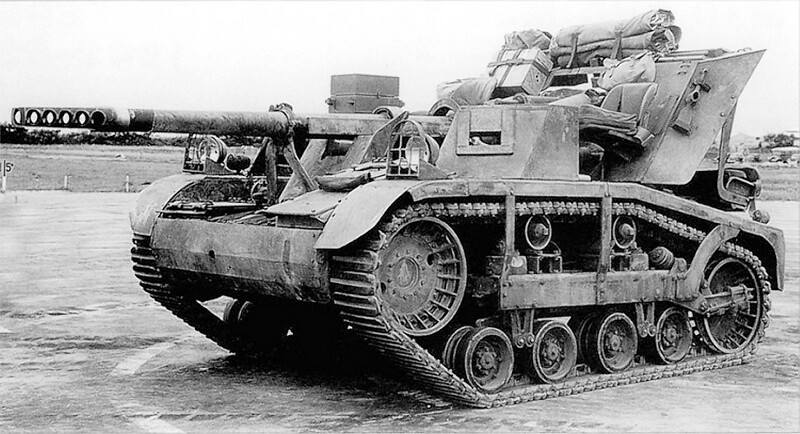 The plan to equip a parent “carrier” A7V with 6 of these small lightweight attack vehicles was abandoned when the vehicles were found to lack a serious trench crossing ability. 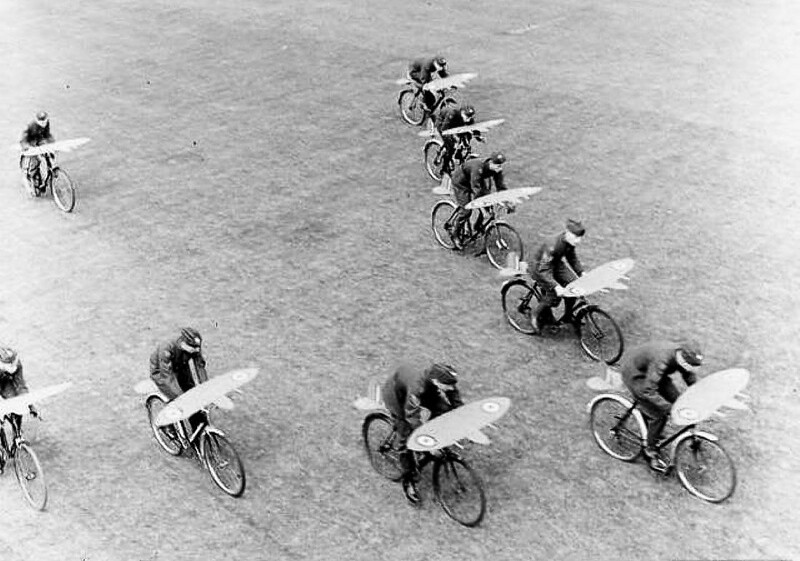 After a hearty breakfast 266 Squadron prepares for the “Boche” …. 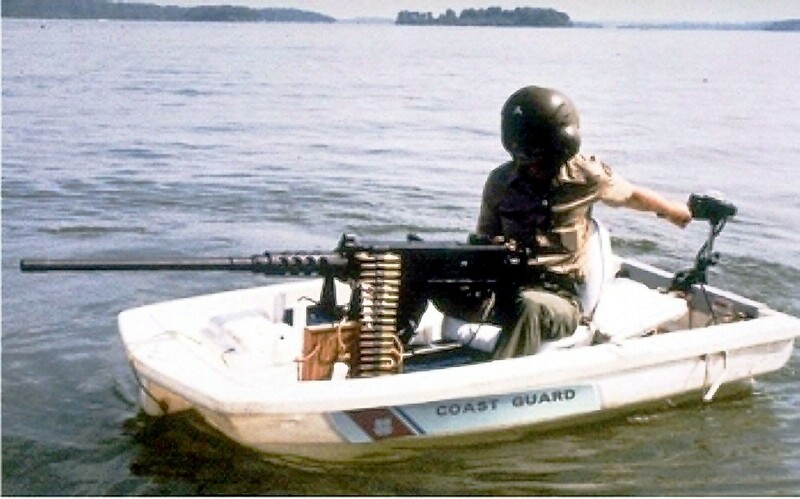 Recent budgetary cuts to the USCG saw this entry gain favour for the potential “lightweight nominal footprint” High Speed Patrol Vessel. 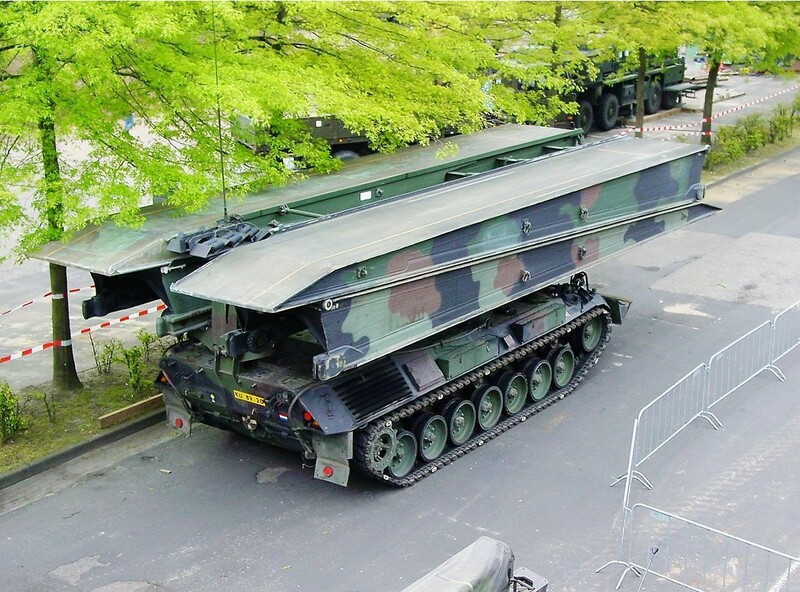 A unit with a sense of priority ensures that their Bierhanger is securely fastened to the towing clevis. Bag End invaded. 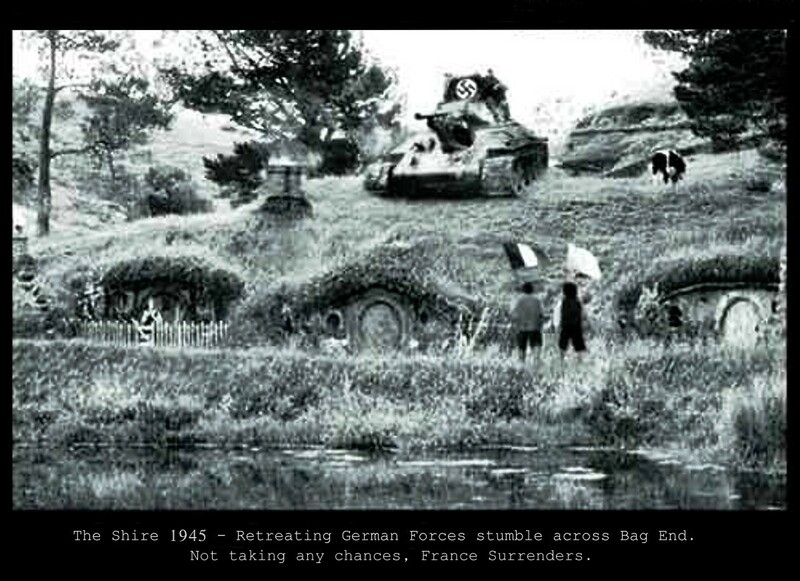 France surrenders. Nuff said. 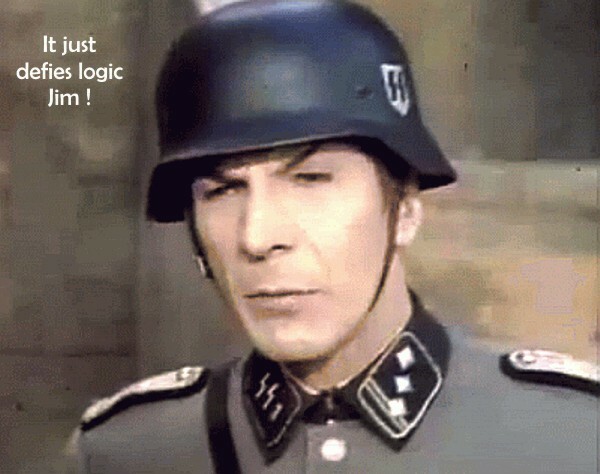 And the last word must go to Spock ……. 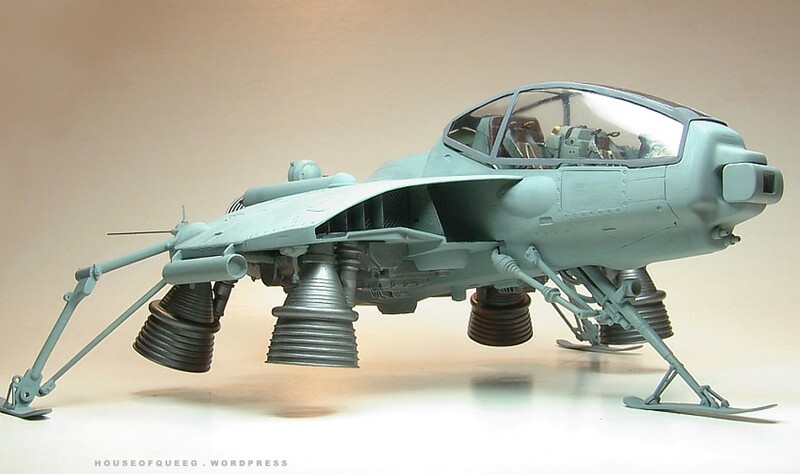 lol this one has a really cool name …..
Ok that is too much, more commonly called the PK40 or Fledermaus (Bat), originally this was designed as a 1/20th scale single seat aerospace fighter and produced by Nitto as part of the quite large MA.K/SF3D universe. 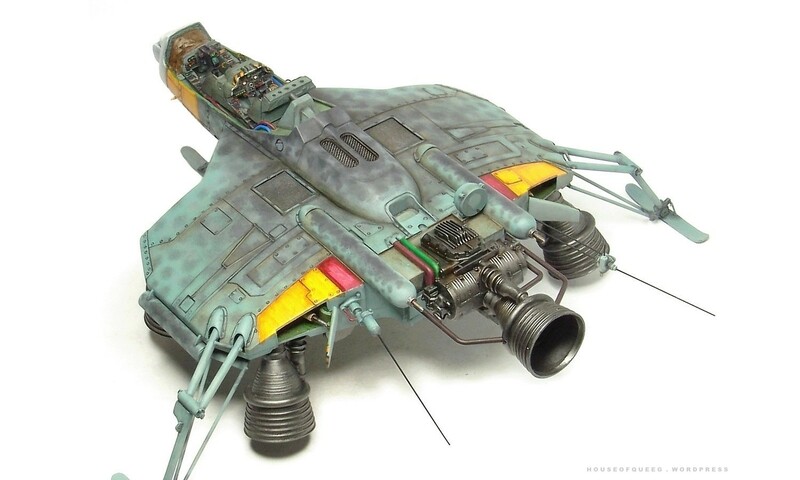 For this job I was asked to convert it to 1/48th and found that with a little jiggery a tandem cockpit from an Apache would fit. 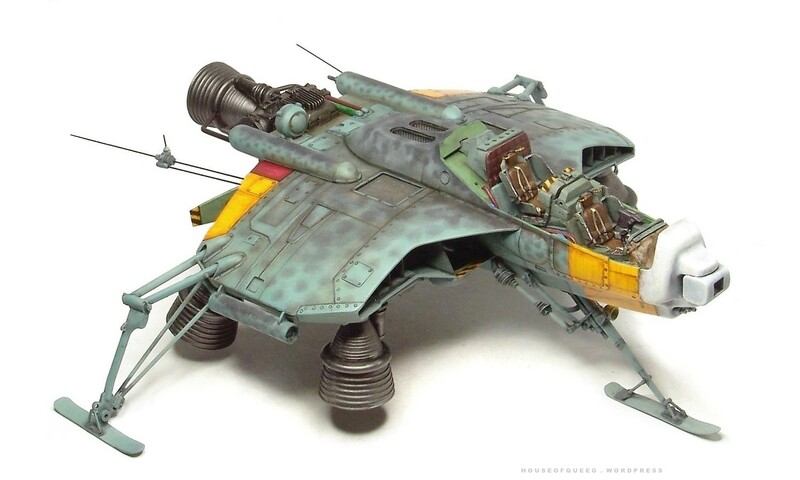 Apart from detailing the cockpit it was a straight forward OOB build with no major flaws. I did seal off the interior of the wings though as it is possible to see in through the large front intakes but all else is stock. 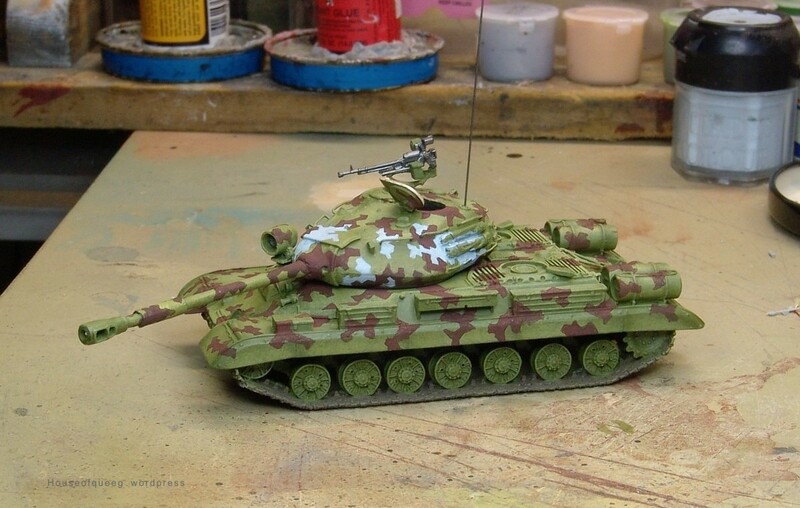 The finish is brush painted with the main colour being enamel and the camouflage and detailing being done with acrylic. 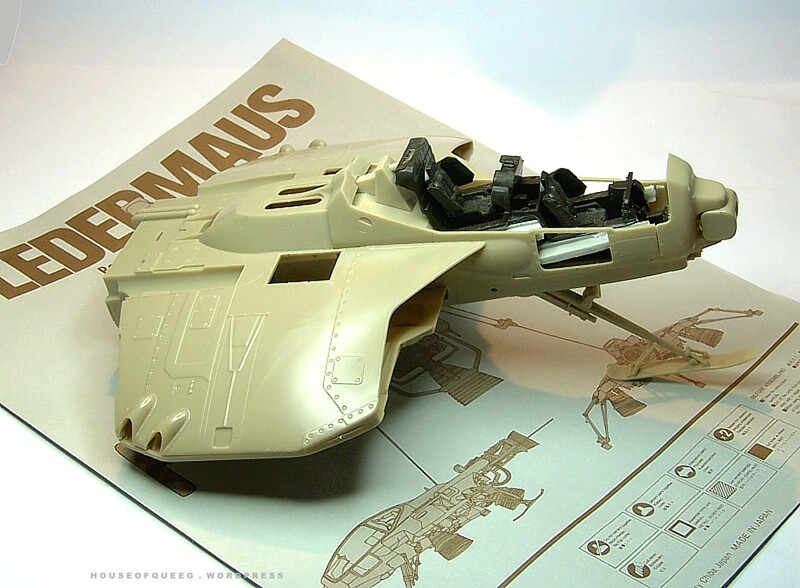 The Fledermaus as it sits at the moment awaiting markings …. 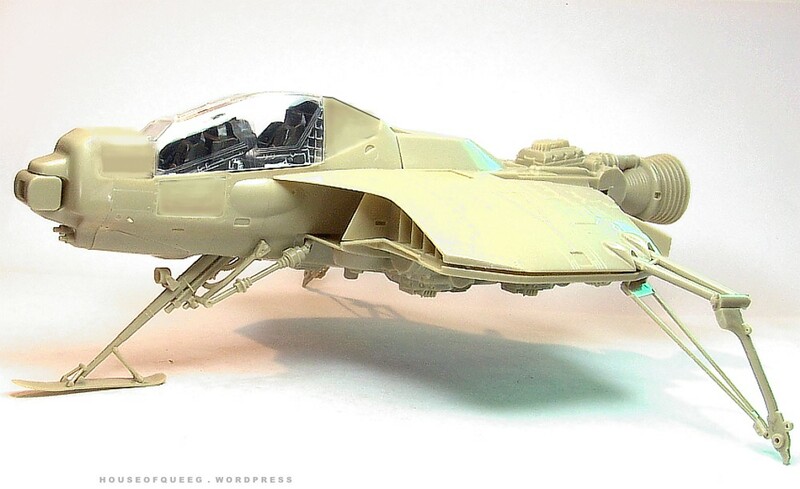 Early cockpit mock up using the Apache canopy. 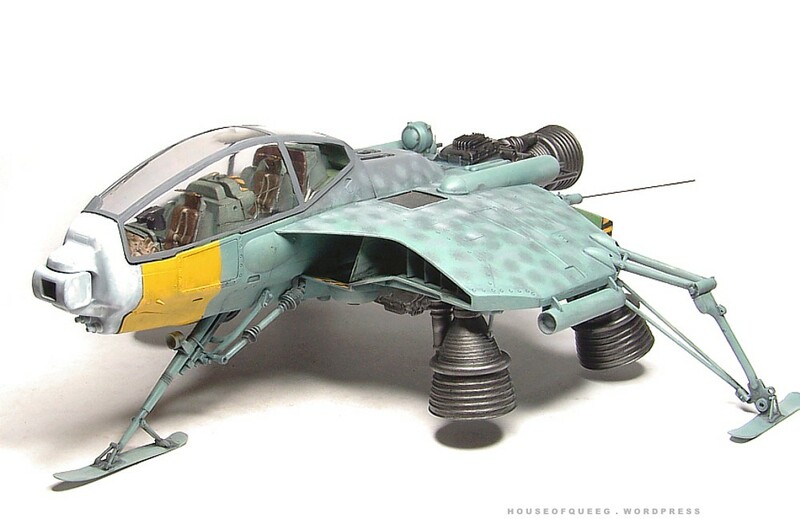 I quite liked this as I reckoned it looked a bit like a Focke Wulf. In the end though we went with the standard supplied kit canopy. Added a few details to add some interest. Made up a hydraulic ram and hoses for the front mounted spade and added hoses to the rear lifting jib. I also made up two large equipment stowage bins for the sides, adding some strengthening ribs using fine wire donated from broken IPod headphones. 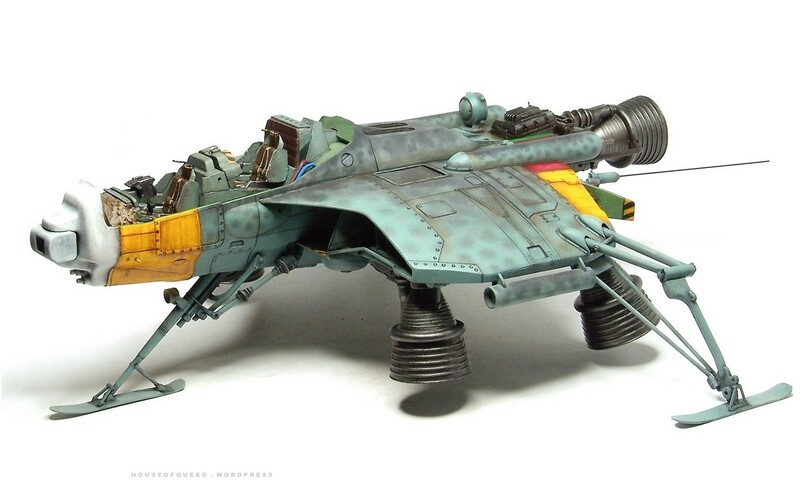 I fitted the kit exhausts then made two Flammvernichter cowlings by bending sprue and hollowing out the ends. 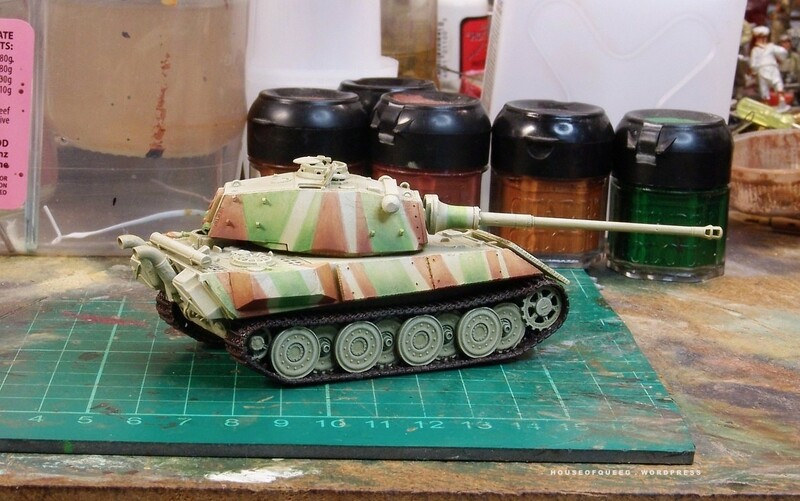 Still to do are some extra tools and jack, tow cables, the locating marks on the hull to fill in, an aerial mount on the top of the rear jib and AA ring and MG to the commanders cupola. 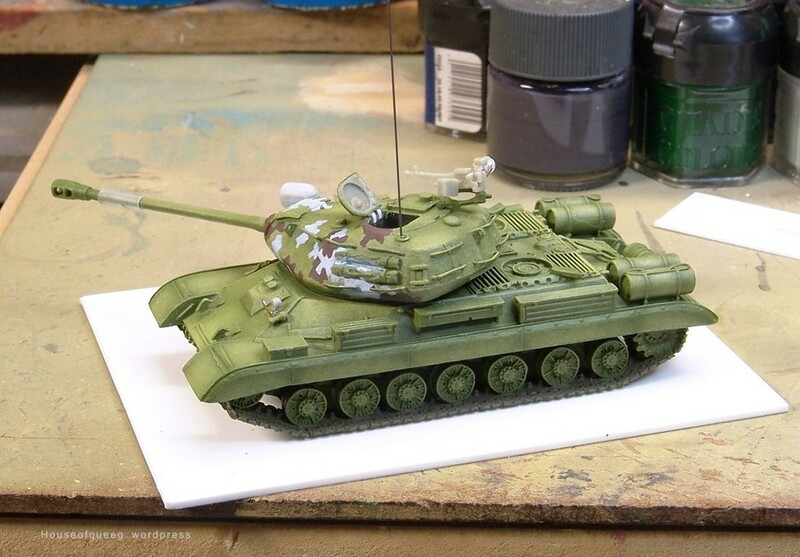 Apart from choosing a suitable driver figure that’s probably all to do before priming it and selecting camouflage. 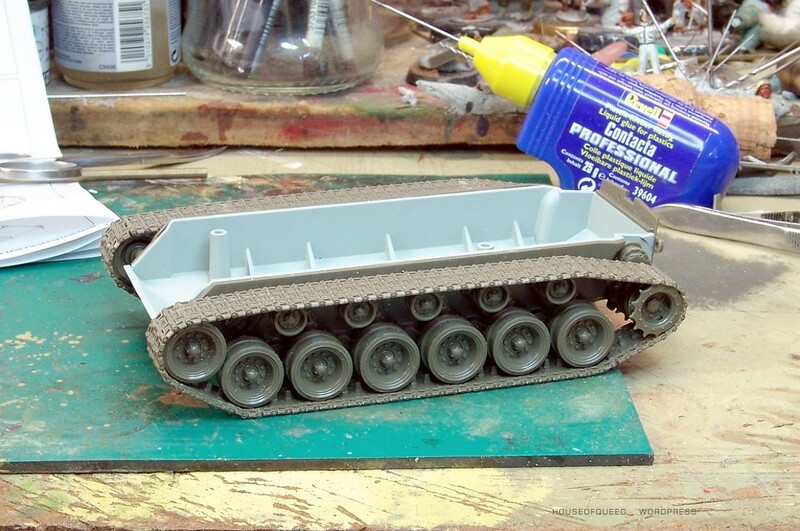 Yup, managed to get the roadwheels and the Revell link n length tracks on today. On the whole it went pretty well. 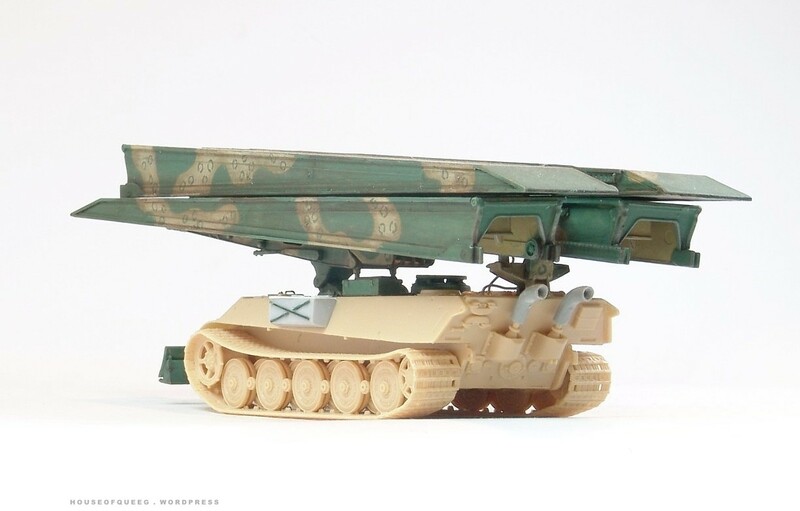 The tracks look good although I feel the Dragon DS ones are a little bulkier and look better because of that, plus the DS ones are a breeze to fit. 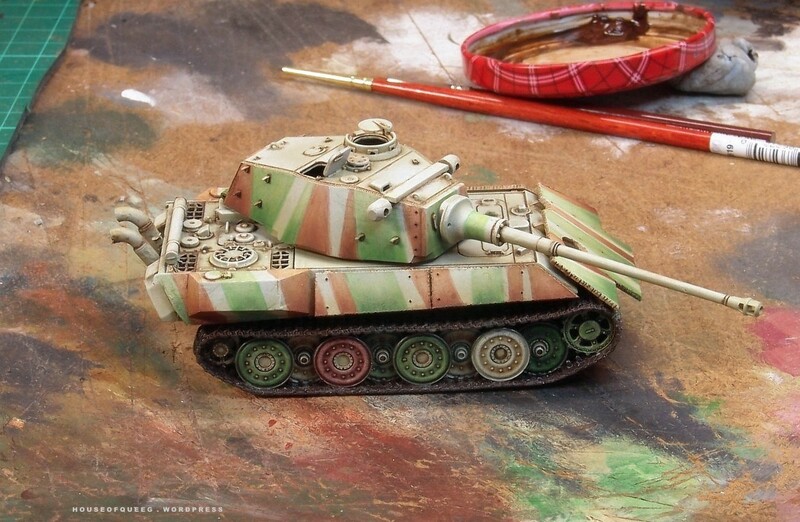 What I really want for my Tiger projects are some of the new OKB late TigerII single link tracks. 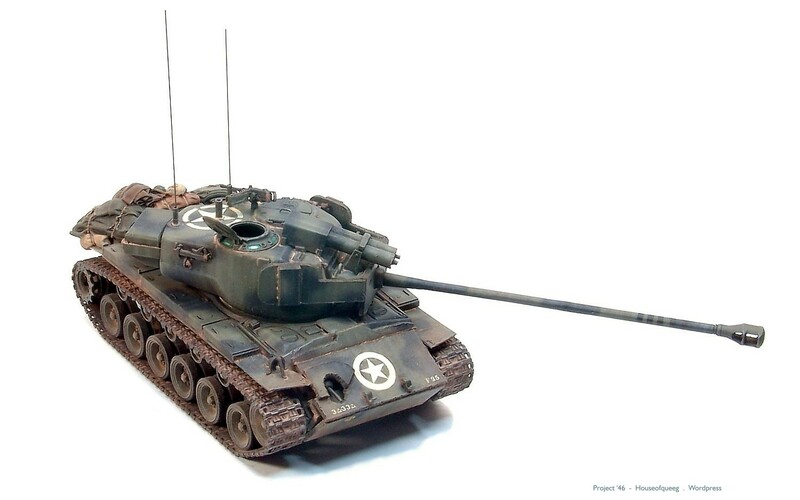 Track sag, my version of the natural Catenary curve …..
An old build revisited ……. 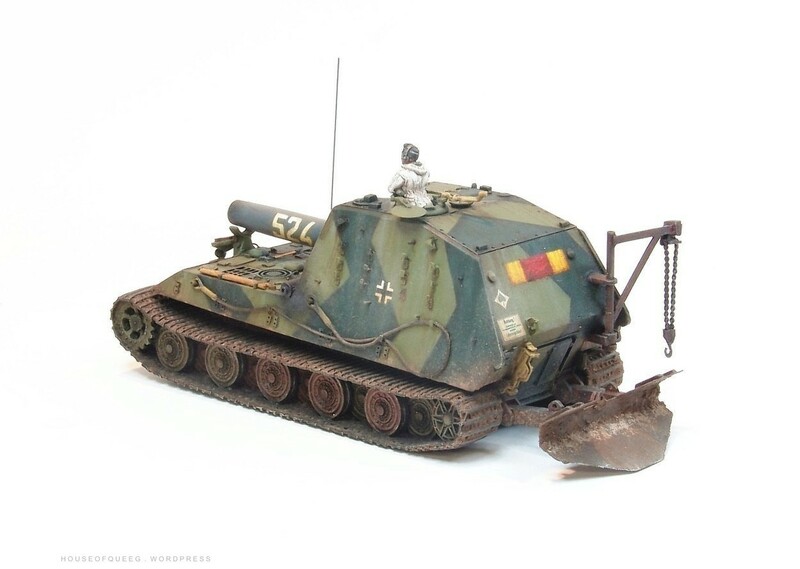 One of my first attempted Project ’46 conversions was a bridgelayer based on a Tiger2 chassis, the Bruckenleger auf PanzerKampfwagen VI (Bridgelayer on TigerVI). 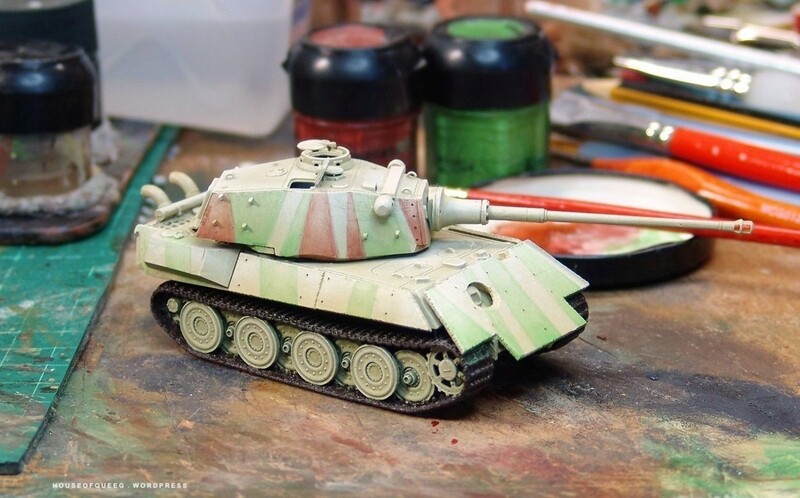 I originally used a Dragon Tiger2 as a base but made a mistake during building that caused me to abandon the build and in fact eventually break it up for parts. 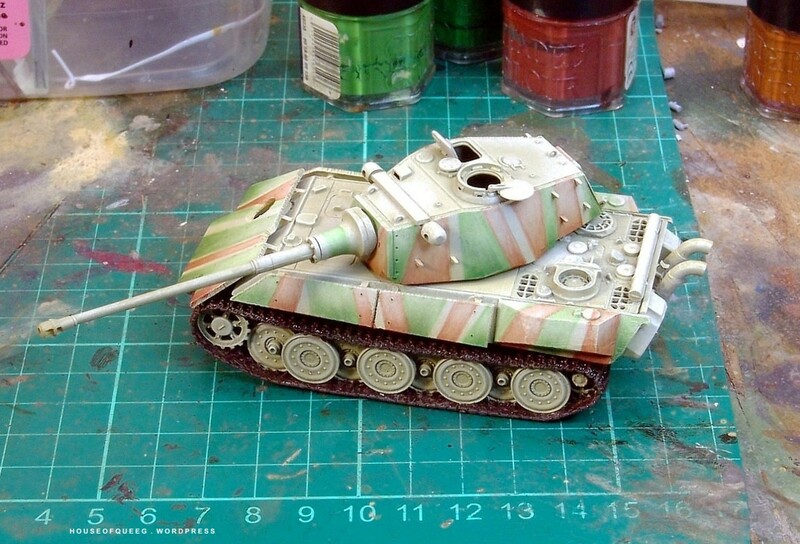 It was one of the early Tiger kits with the black tracks and they were too short and resisted glueing. SO after much pain and superglue I finally got them on, it was late at that stage (about 1.30am) so I went to bed feeling pretty happy that I’d won the track battle. 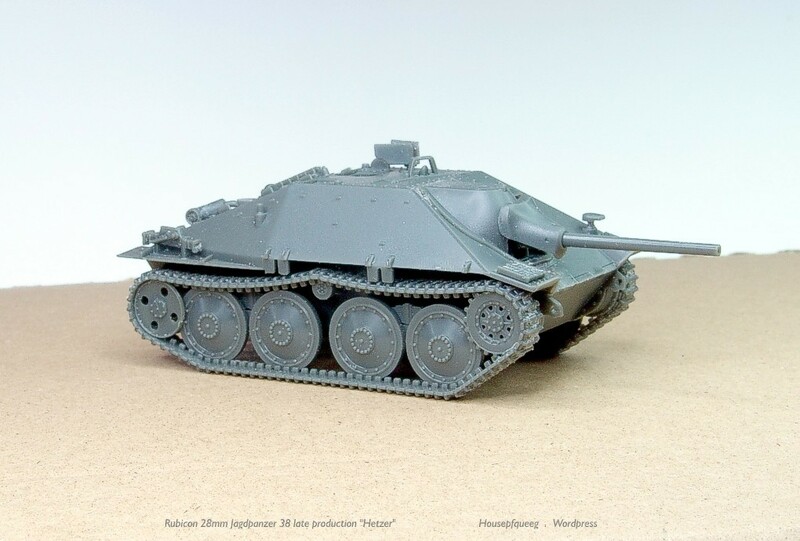 When I looked at it the next morning I realised I’d managed to set the tracks too far to the outside of the roadwheels, with the guidehorns to the outside. Not much of an error you say? Well it was to me, I was really steamed that I’d made such a noob error. So I tried to prise that tacks off. Carefully. Tried cutting them, managed to cut the track. Working and pulling at them managed to break off the tip of a roadwheel that was more attached to the track than to itself! 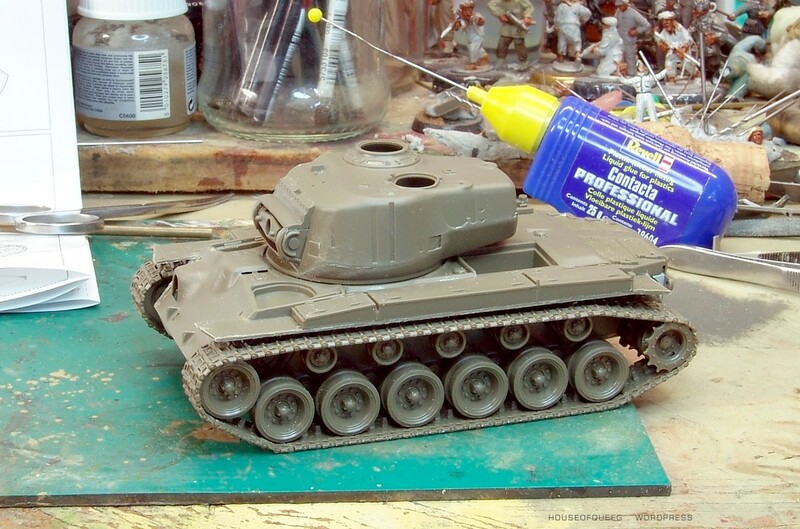 Apparently I’d used a lot of superglue and it’d reacted with the vinyl tracks to create some sort of superbond. NASA should employ me as a chemist ….. 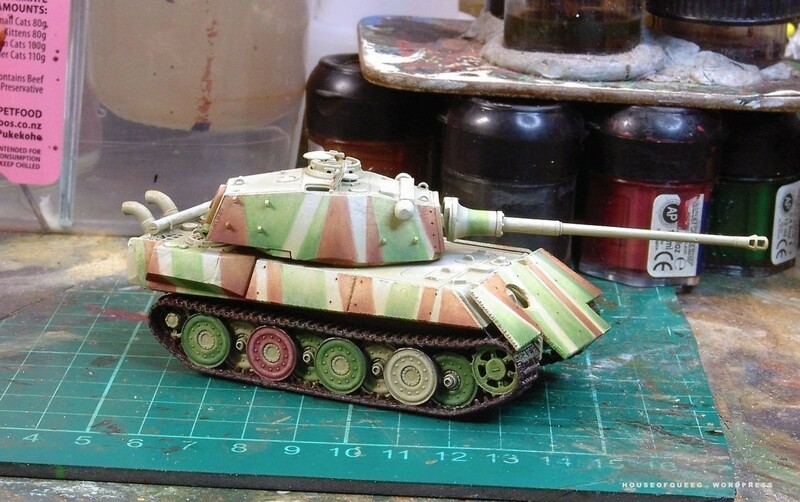 Finally I decided (after repairing the cut track and broken roadwheel) to carry on and see if I’d still notice after paint. 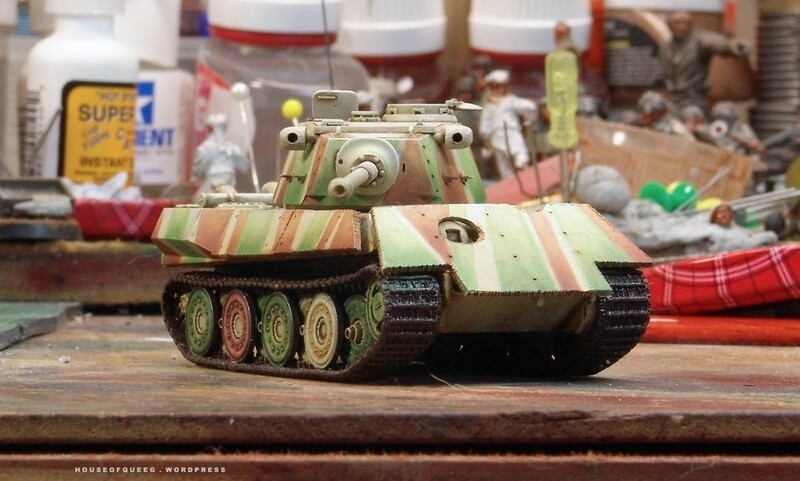 One of my “issues” is that I’m very picky with my own builds, especially as I don’t get much of my own stuff completed compared to builds I do for others (I’ve painted around 500 vehicles and countless historic figs). 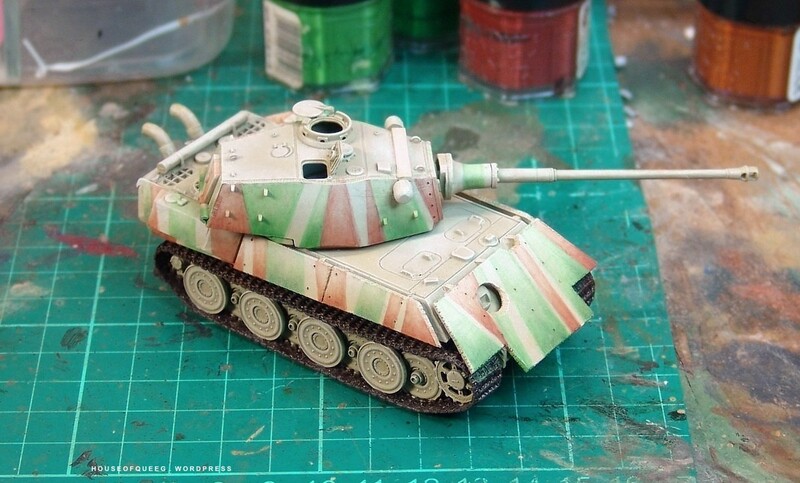 So I laid in the paint and got it to the basic camouflage and shade stage …. 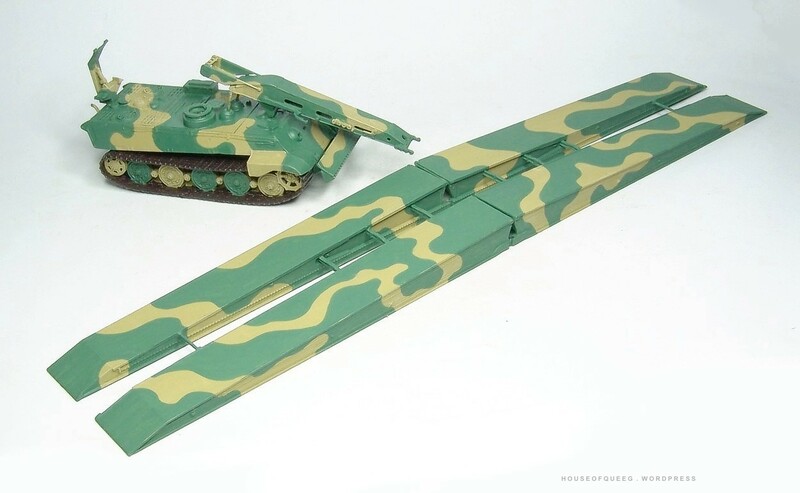 and yeah, the tracks still bugged the crap out of me. 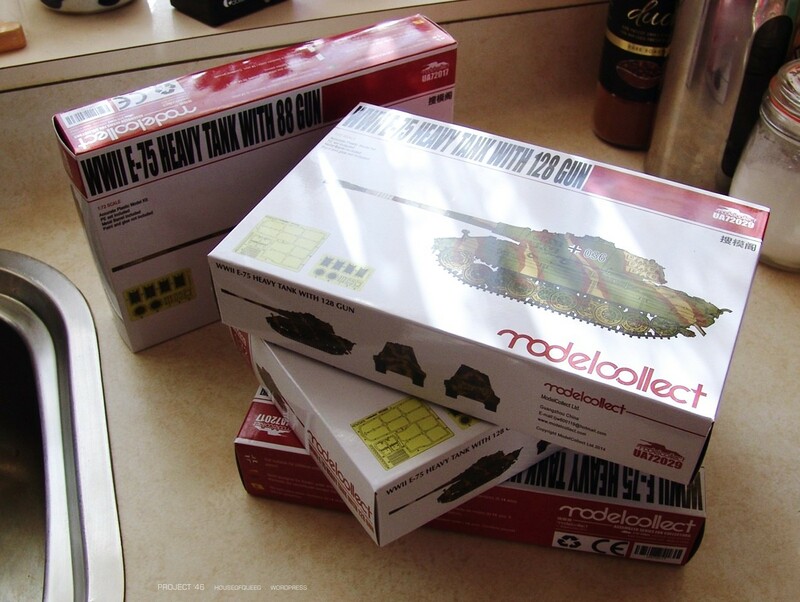 I stuck it on a shelf ….. and the tracks still mocked me with their …. trackiness. And so to cut a long and by now tedious story short – one day I broke it up for parts. 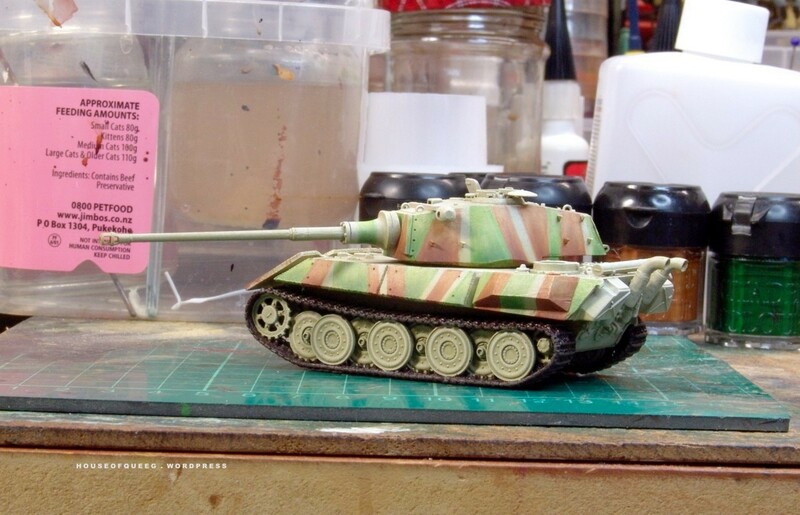 And so the “new” Tiger Bruckenleger takes shape. 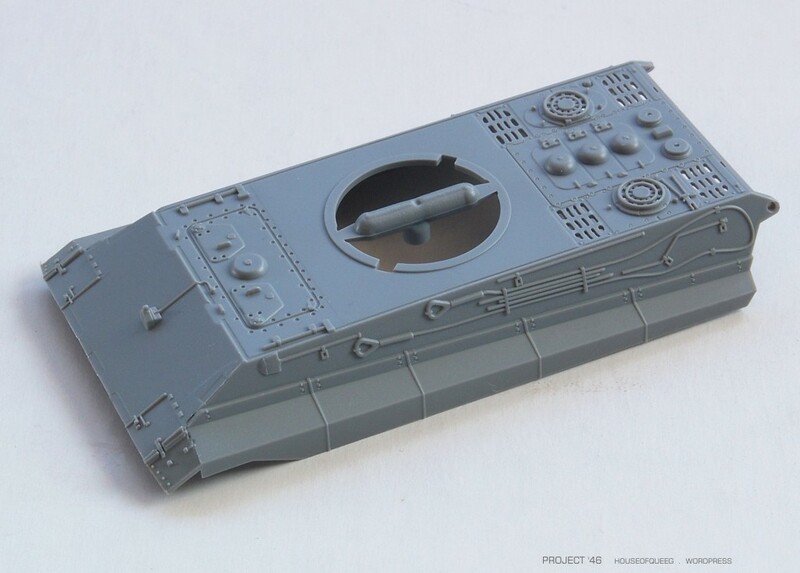 I’m using a donated Revell Tiger hull and it’s the first time I’ve built one so I’m interested to compare it to it’s Dragon opposition. 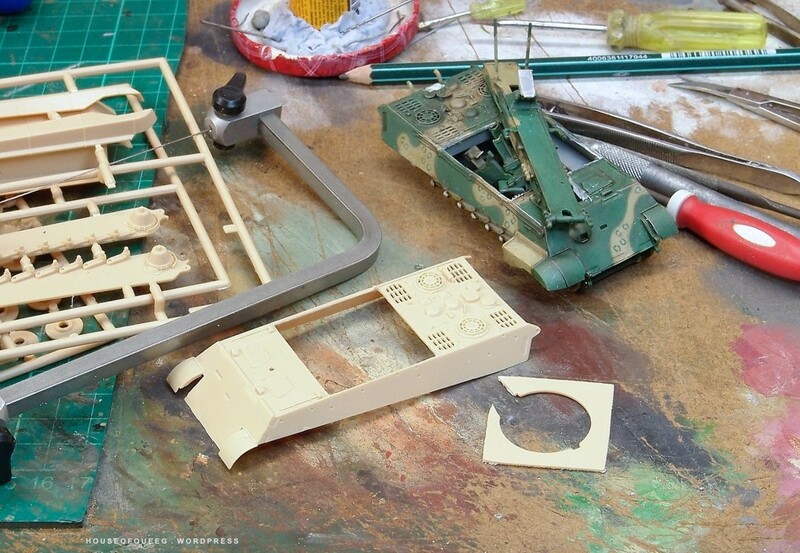 The Brdegelayer parts come from the old build and are originally sourced from the Revell Leopard “Biber” Bruckenleger kit. These bits are a bit “used” by now but will have to do as the price of a new donor kit would feed me for a week lol. 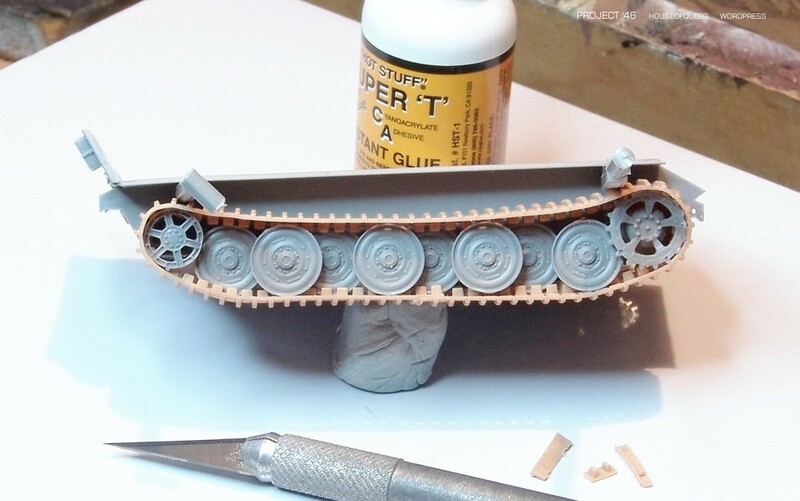 Below is the Revell hull with the center section cut out with a fret-saw. 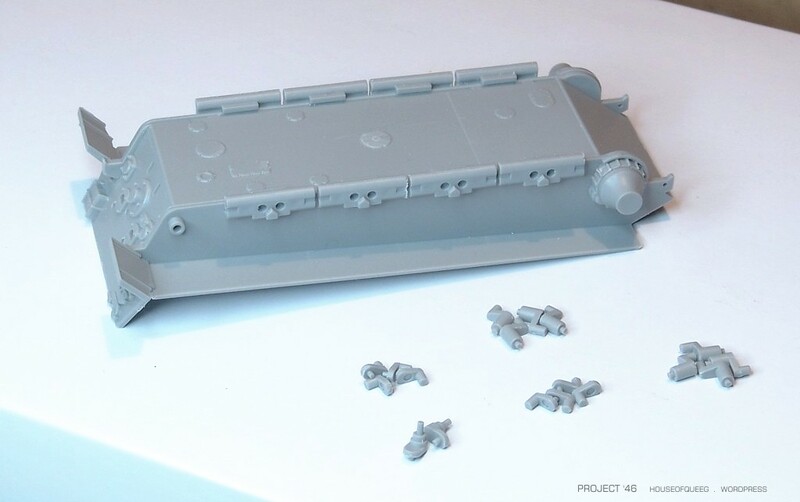 To be honest this is a pretty easy conversion with the replacing of the center hull sections being the only bit requiring some care and accuracy. I marked out the section with a pencil, cut close to the line with the saw the squared and adjusted the fit with a file. Here’s the centre bridge lifting section in place. the gap on the front join with be hidden with a “weld” bead made from greenstuff. 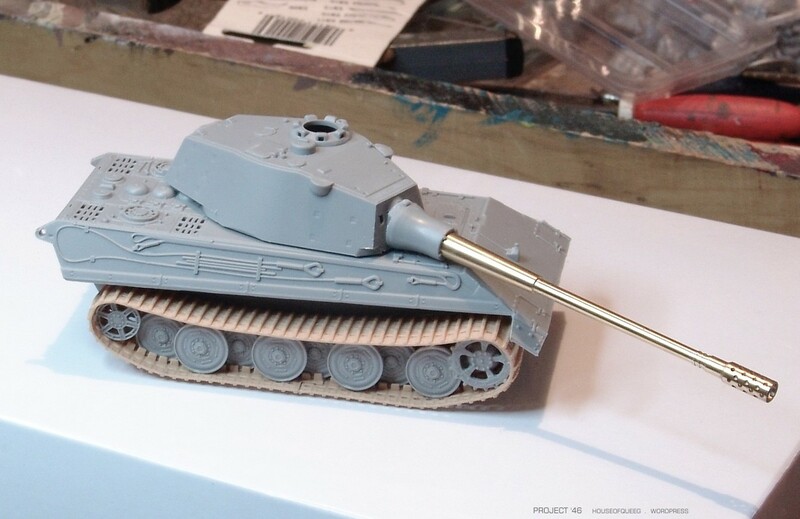 As I wanted to add some better detail this time I’m going to drill out and fit a replacement drivers hatch. 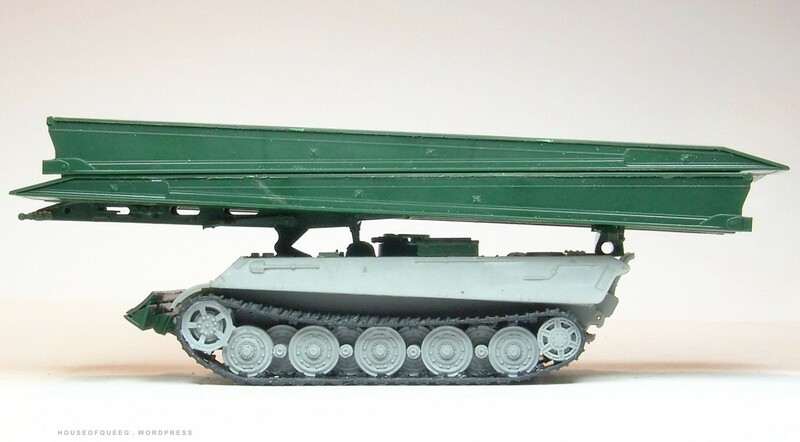 I figured aligning the bridge would be a tricky job so the driver would most likely have his head out of the hatch. I then fitted the bridge lifting arm, rear lifting jib and added the greenstuff weld beads. 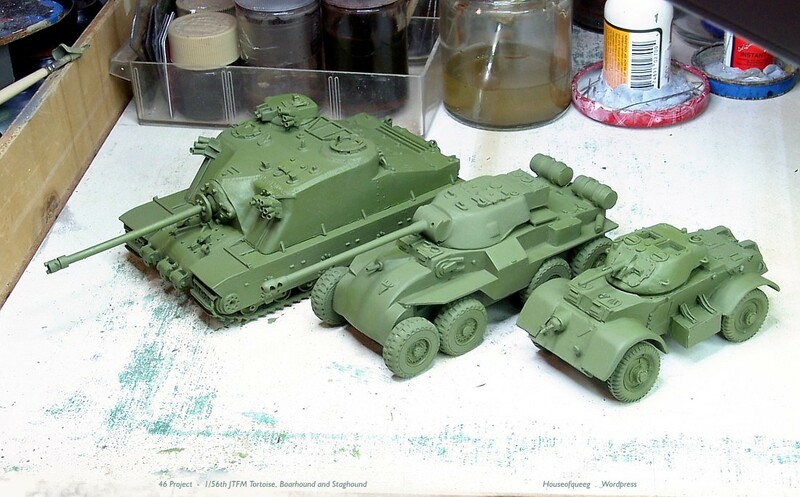 They’re a bit over-scale but will do the job under paint I think. 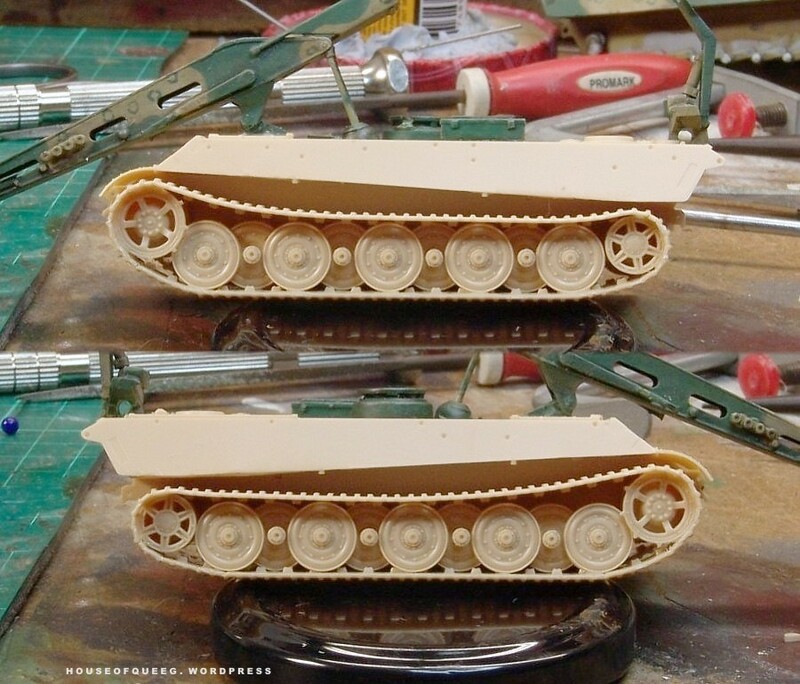 Although difficult to see in these pretty average workbench pics, I also hollowed out the solidly moulded periscopes. I’m going to have to make a decision before fitting the front spade. 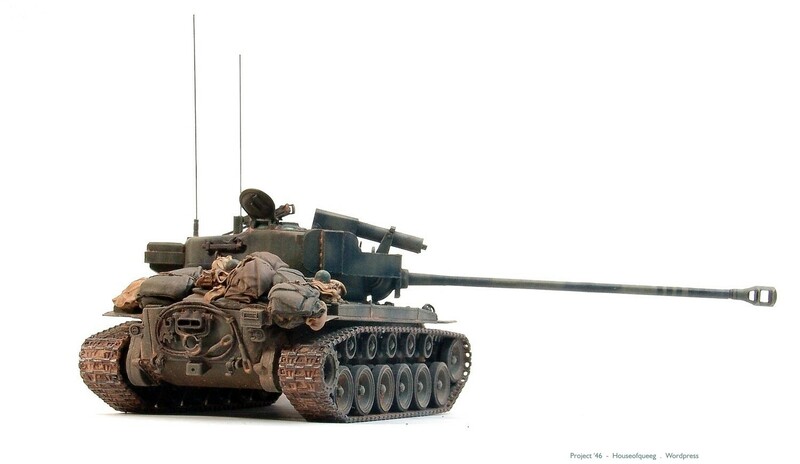 As the Tiger has it’s final drive mounted in the front (unlike the Leopard which is rear drive) the spade hydraulics can’t be fitted in there under armour and would require external rams. 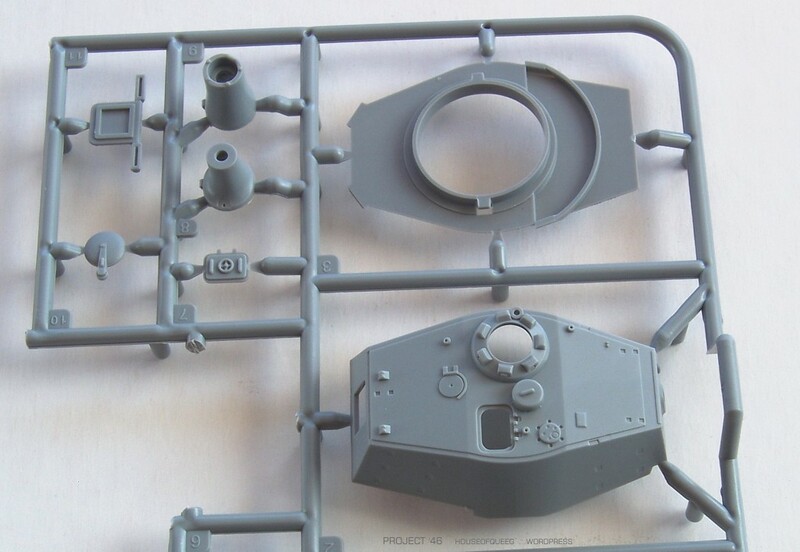 So I may run an armoured cover up the front hull and into the area where the MG kugelblend mount is, the theory being the hrydraulic powerpack replaces the bow mg and gunner. Then fit some rams and hoses to the jib …. or do it easy like I did the first time and just fit the spade as is …. Finally here’s some pictures of my previous build so you can see where I’m heading with all of this …..
And it’s real modern day namesake …..
A little more shading …. Darkened and blended the tones some more. It might not look much different in the pictures but it’s significantly better in R/L and a good base for the next steps. Coloured the roadwheels too for some variety but I’m unsure if I like them. 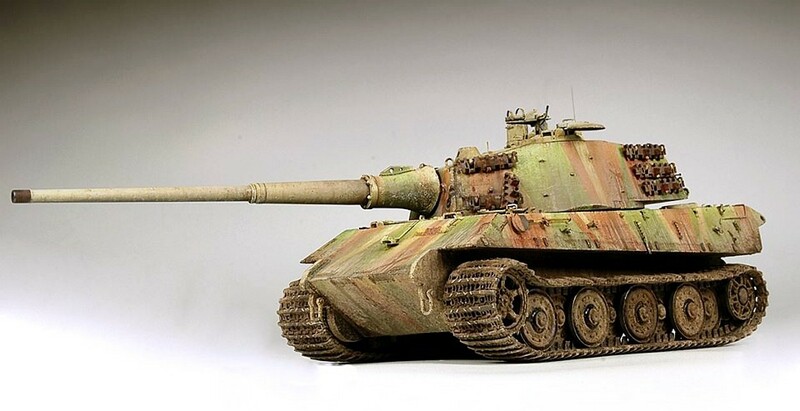 The plain Dunkelgelb probably gave more artistic contrast but kinda didn’t fit with that well thematically with late war and ’46 colour schemes. I shall have to ponder the wheels a little more. 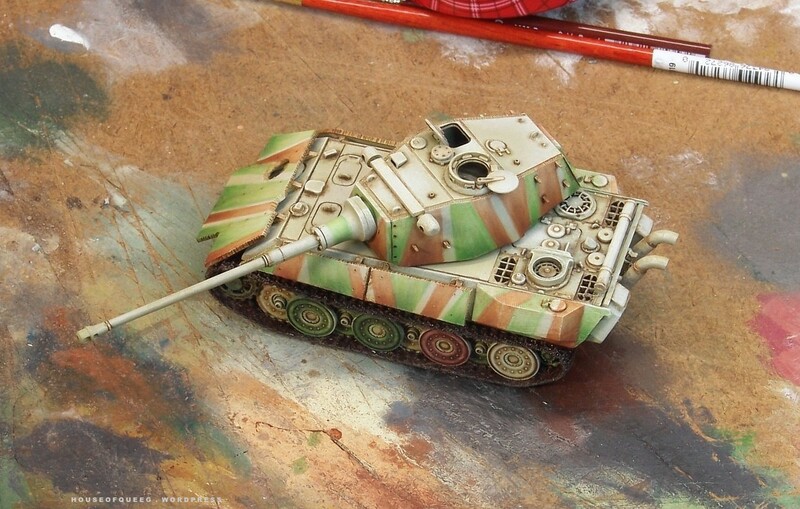 Apart from that it’s onto the lining and weathering ….